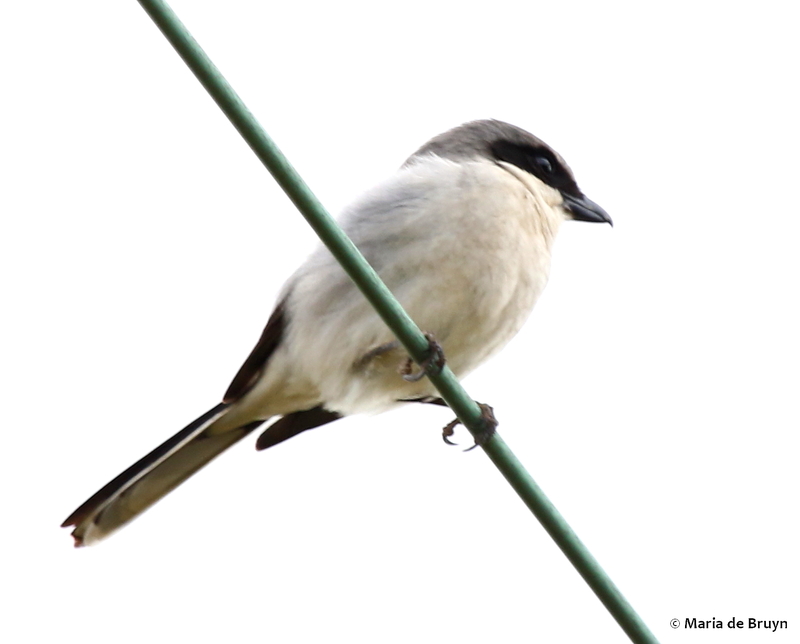 Chasing Joseph – excitement evoked by an effervescent bird! 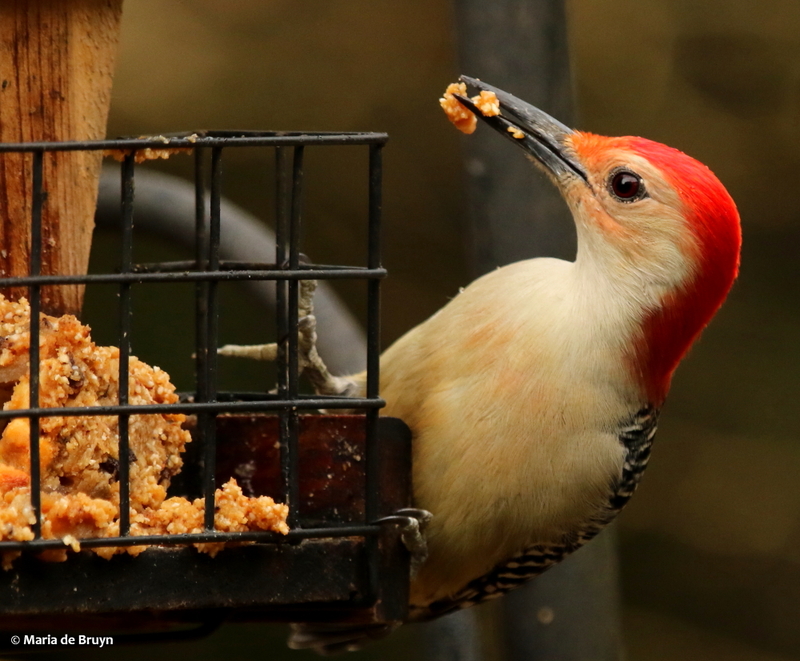 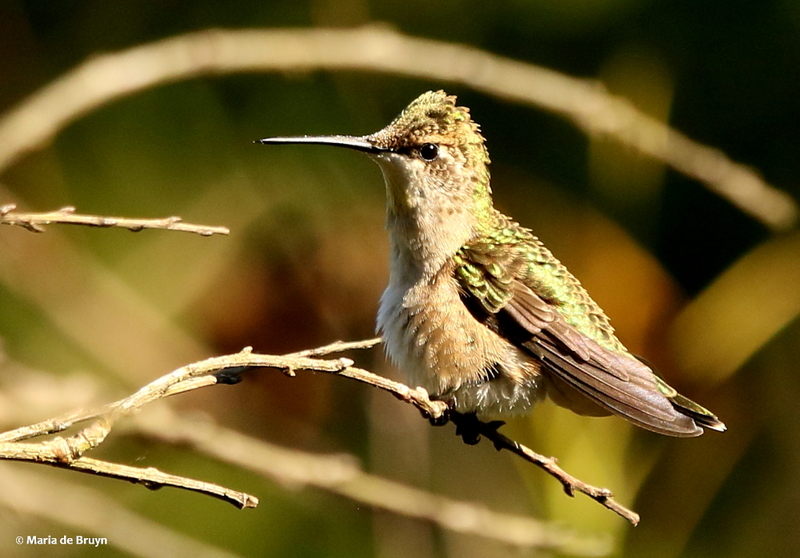 Birders can be quite enamored with their pursuit of avian species, some making special trips just to see one bird that they haven’t seen before. 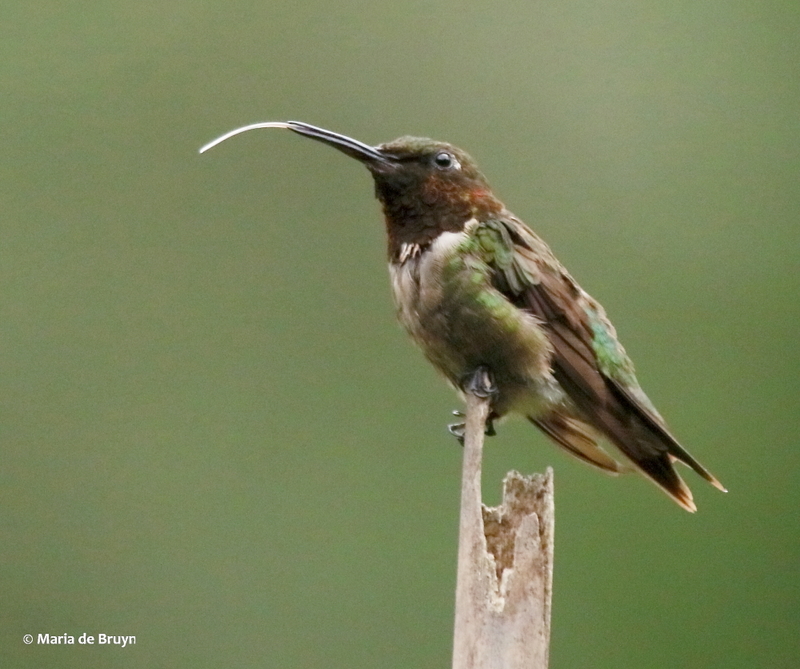 Such trips may be within an hour or two of their homes, but there are plenty of birders who travel to other (even distant) regions within their own or another country as well. 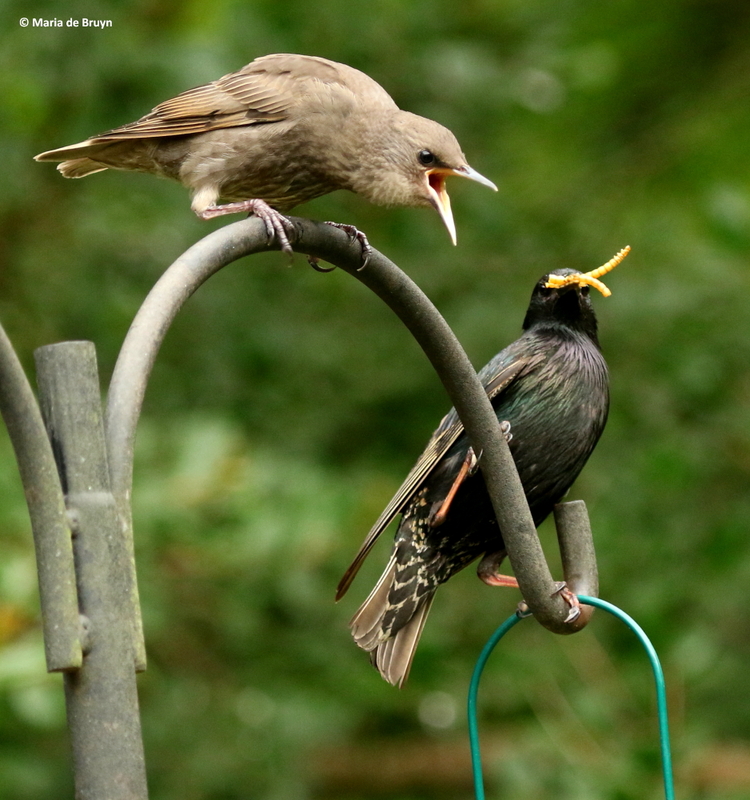 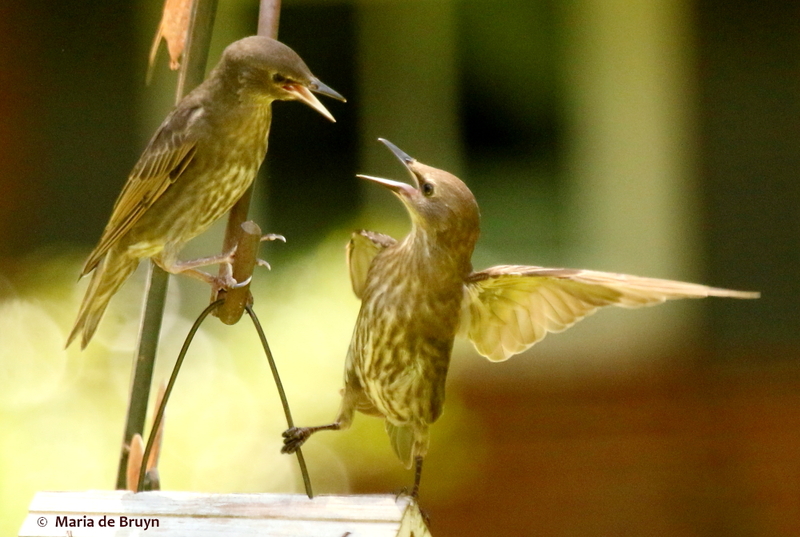 Some people might say they are a bit crazy, but birding is actually one of the sanest ways to appreciate nature. 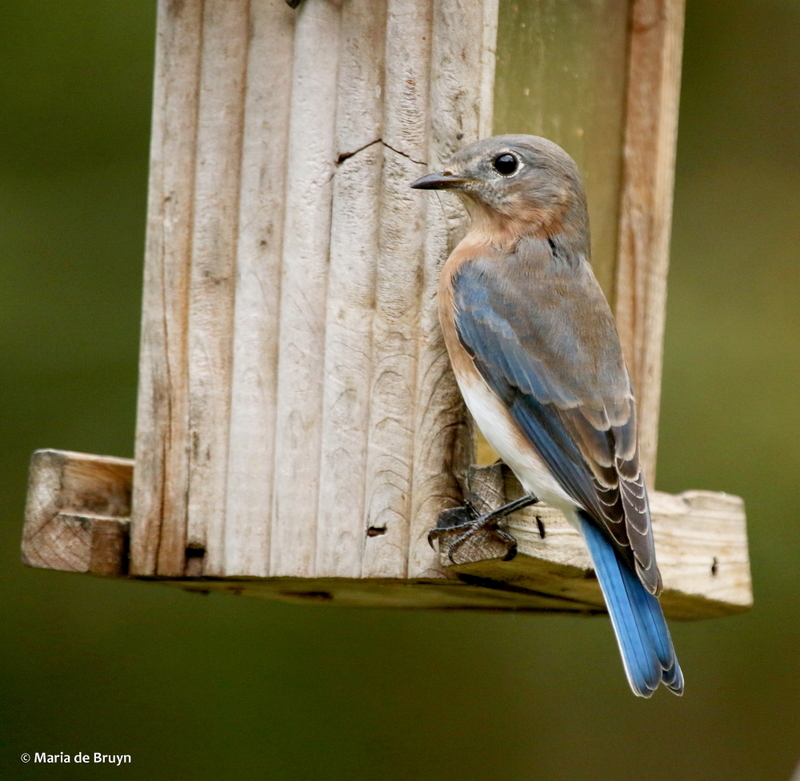 It generates knowledge, provides rest and relaxation (well, mostly) and many birders contribute to environmental protection and conservation, even if they restrict themselves to observing local species like Eastern bluebirds (Sialia sialis). 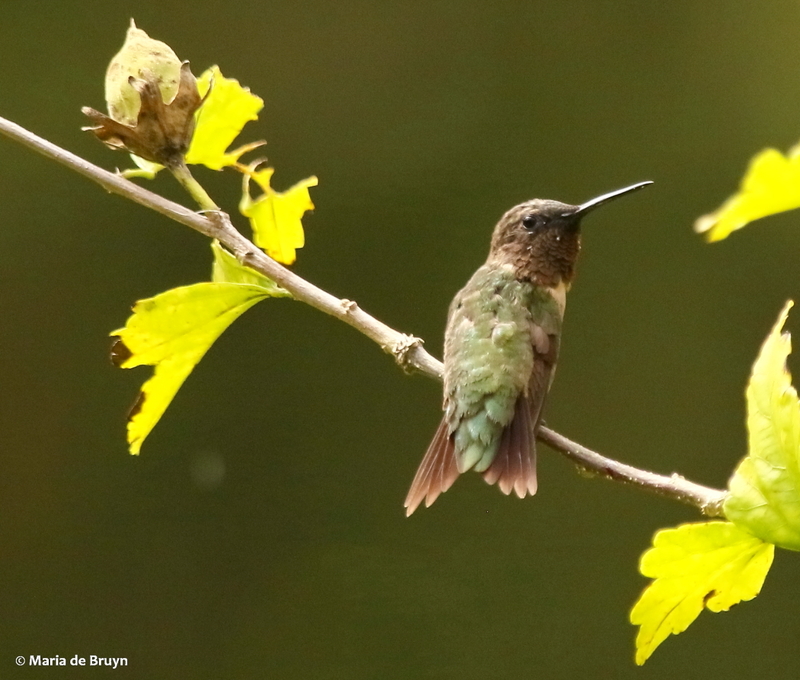 In addition, while much is made of the money that hunting fees provide for environmental programs, birders also make economic contributions to society – through donations to environmental protection groups and expenditures on birding supplies, ecotourism, etc. 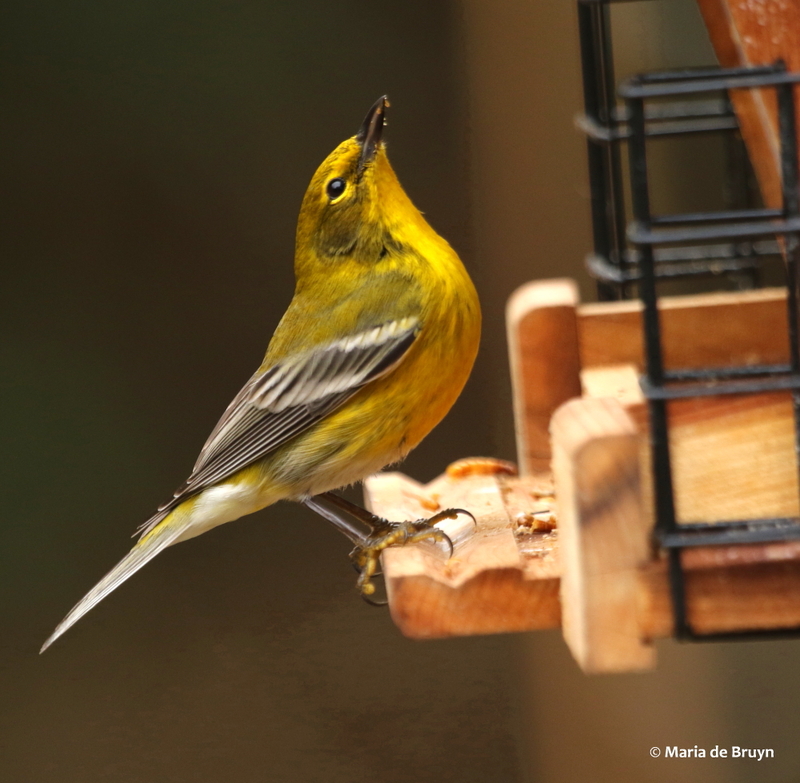 The Audubon Society reports that birders and other wildlife observers spend $916 million in the US state of North Carolina alone each year! 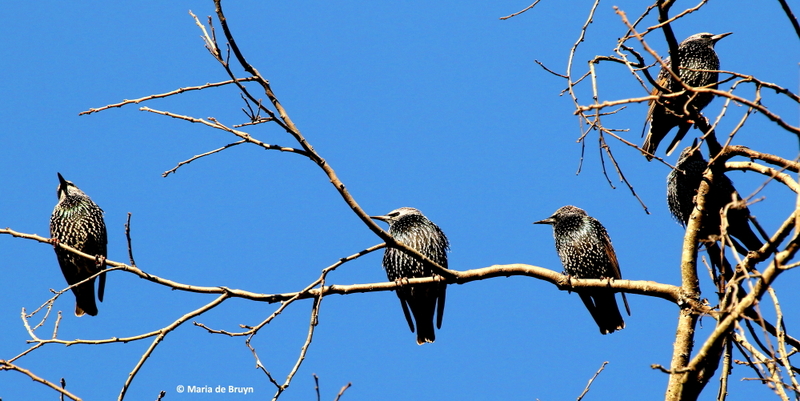 So, in the last half year, I’ve become a birder who will make a special trip to see a particular bird. 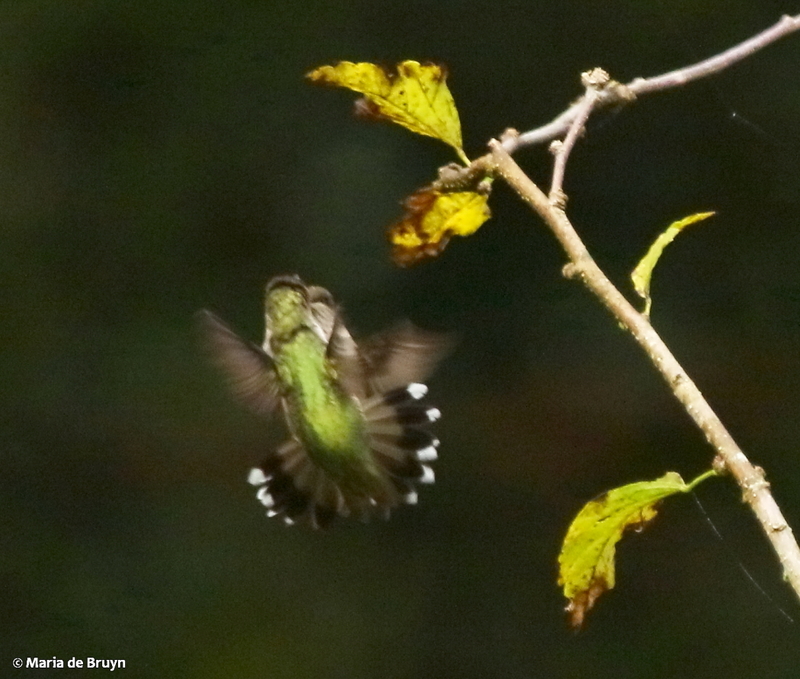 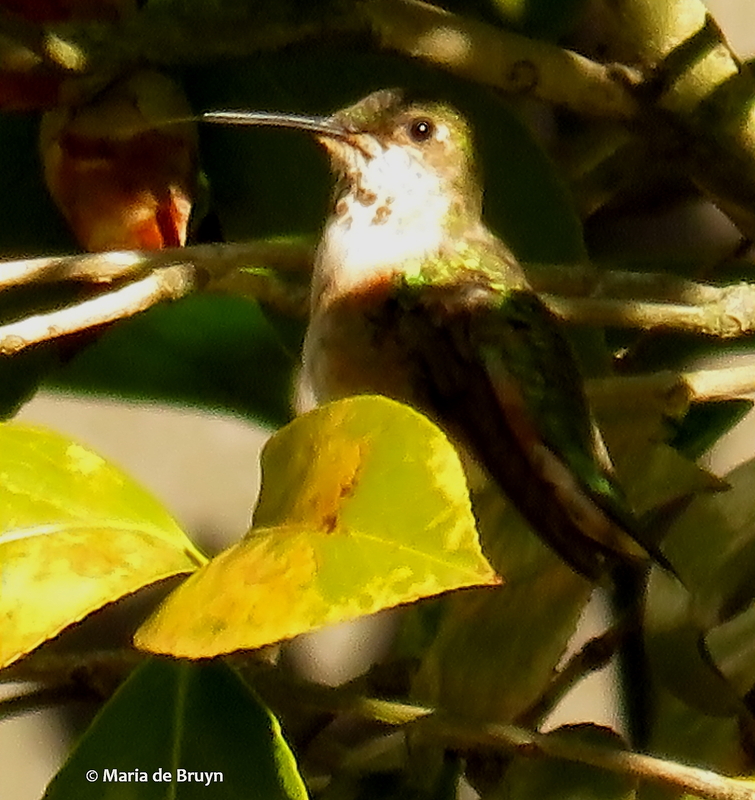 In October last year, I traveled 77 miles with friends to see a buff-bellied hummingbird (Amazilia yucatanensis). 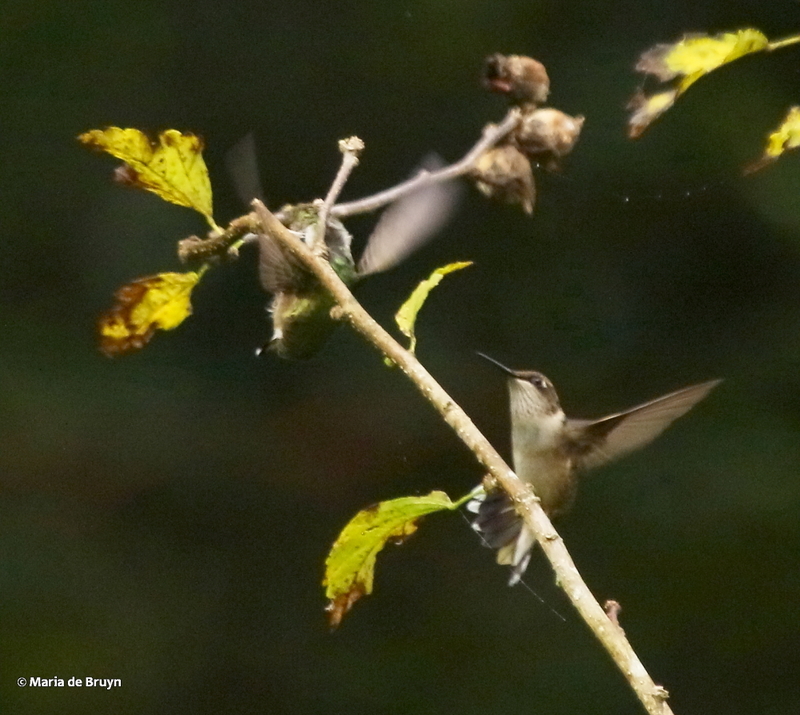 This year, a shorter distance (22 miles) led me twice to the calliope hummingbird (left, Selasphorus calliope), which is the smallest bird species in North America outside Mexico. 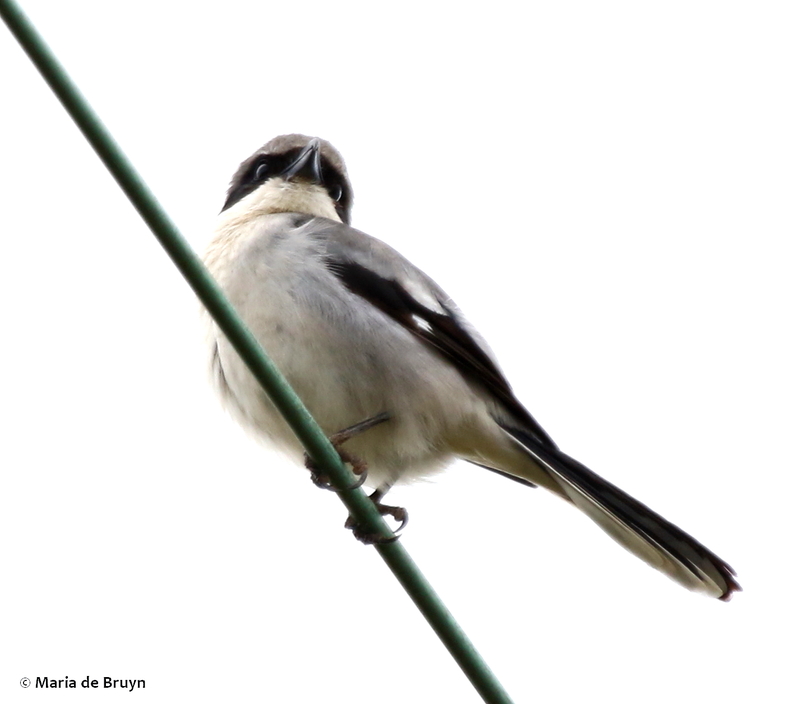 The first visit was pure serendipity; two other birders (Lucretia and Lorentz) and I met birding guide Jan at a reservoir and he mentioned having seen the calliope the previous day. 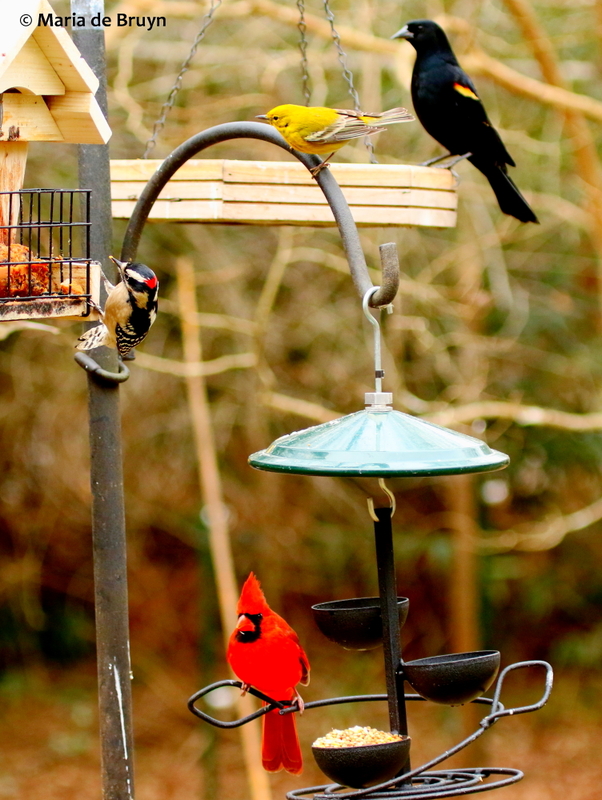 It was only a 10-minute drive from where we were, he said, and the couple hosting the bird was very nice. 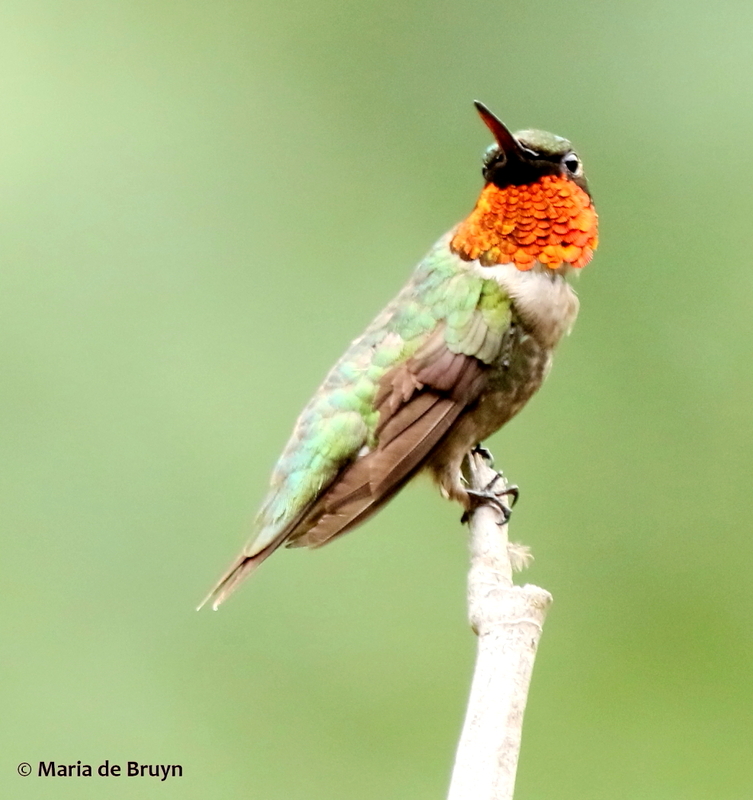 So we jumped in Lorentz’s car and headed over to the next county in pursuit of our lifer (a bird that one sees for the first time in one’s life). 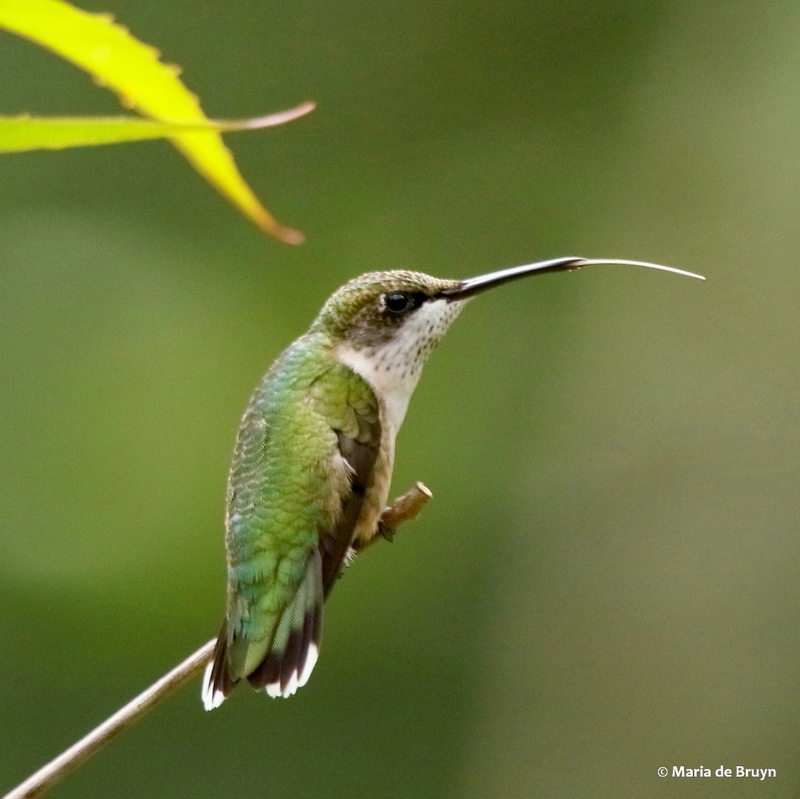 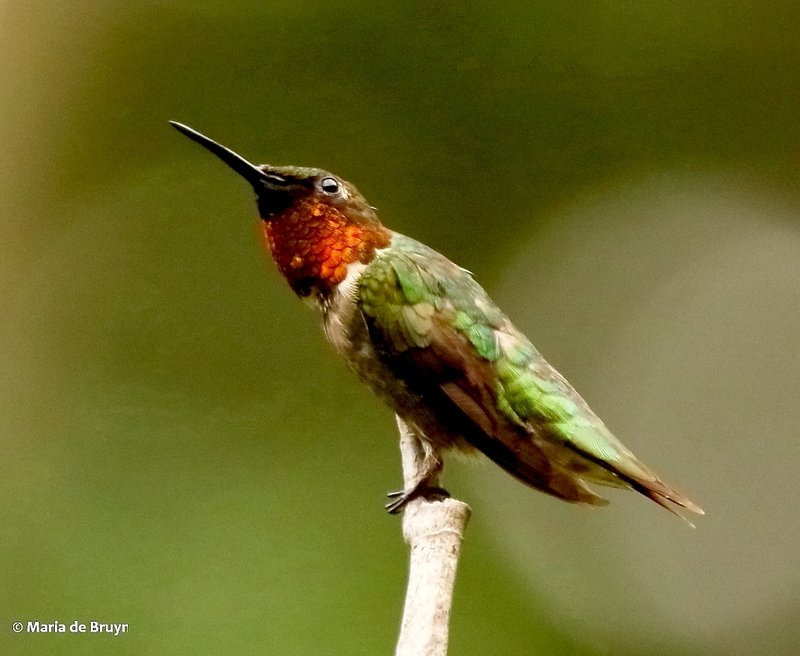 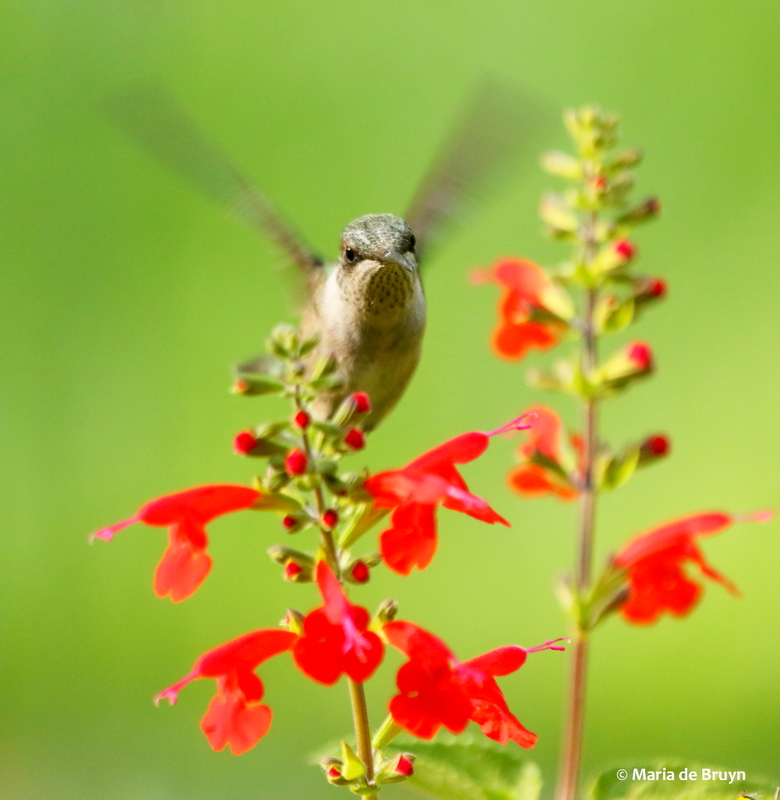 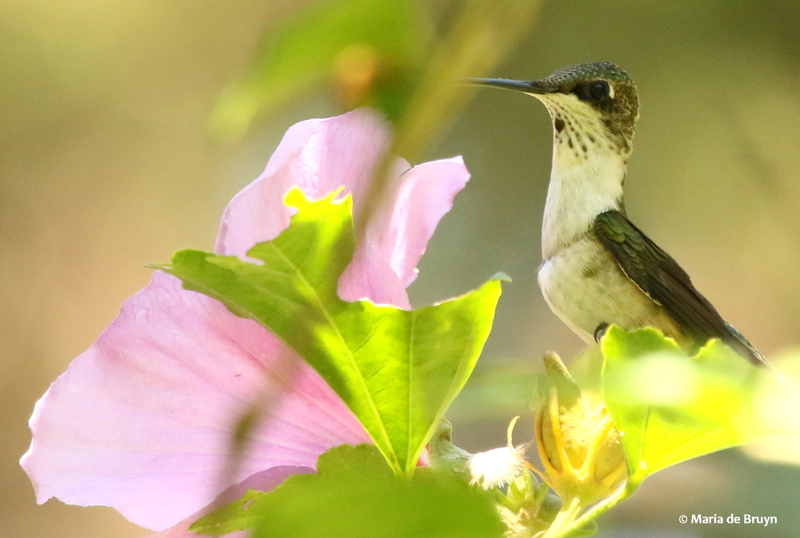 The calliope hummers are the tiniest long-distance migrants of all the world’s birds, traveling from the mountains of the Northwest USA and Canada to Mexico and a few spots in the southern United States in winter. 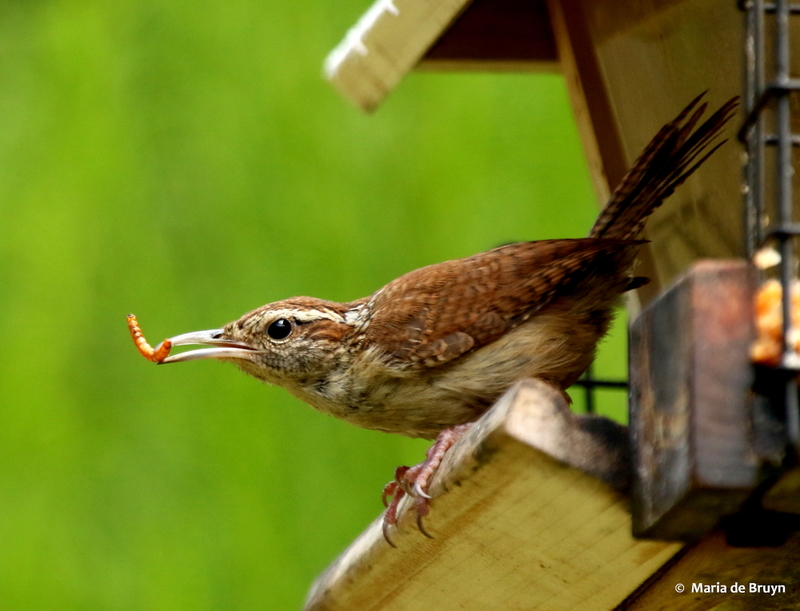 This year, however, a young male landed in the Malinski’s yard; they named him Joseph. 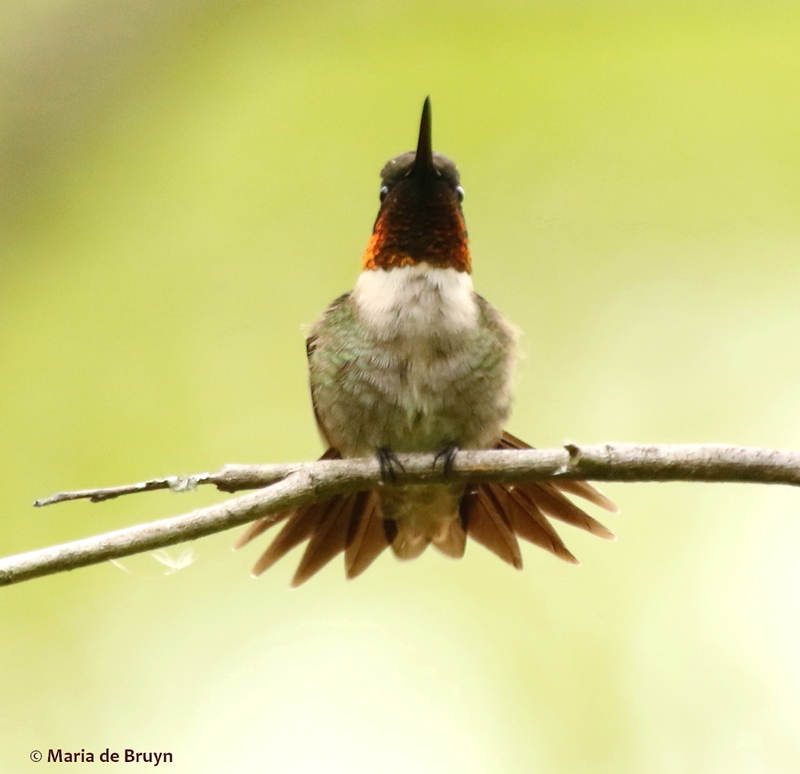 Some other instances of calliope hummingbirds in the Southeastern USA have been noted but they are still fairly unusual. 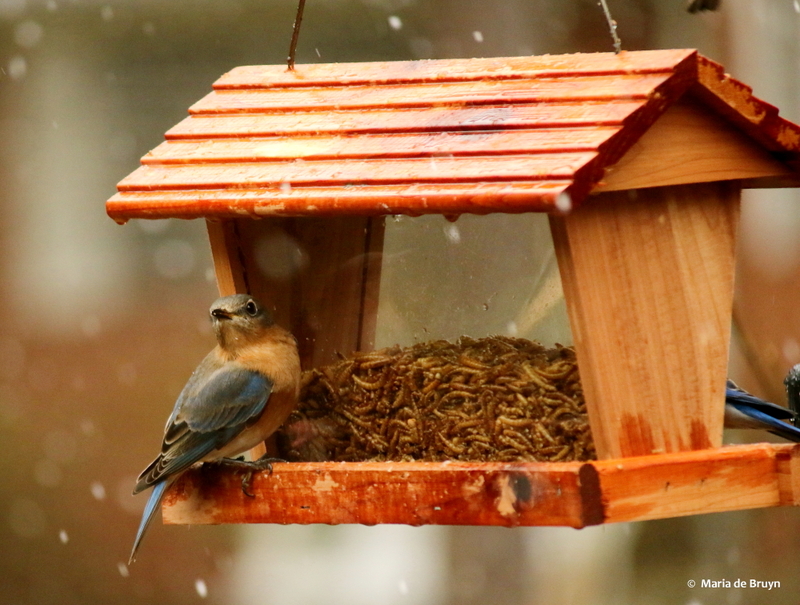 However, it’s speculated that they may become more frequent winter visitors because of environmental changes associated with human activity. 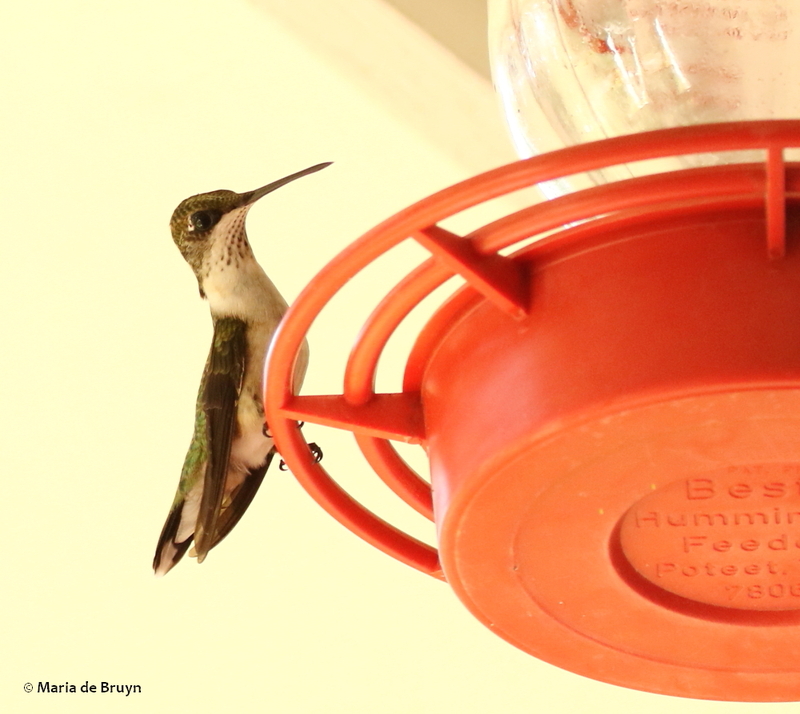 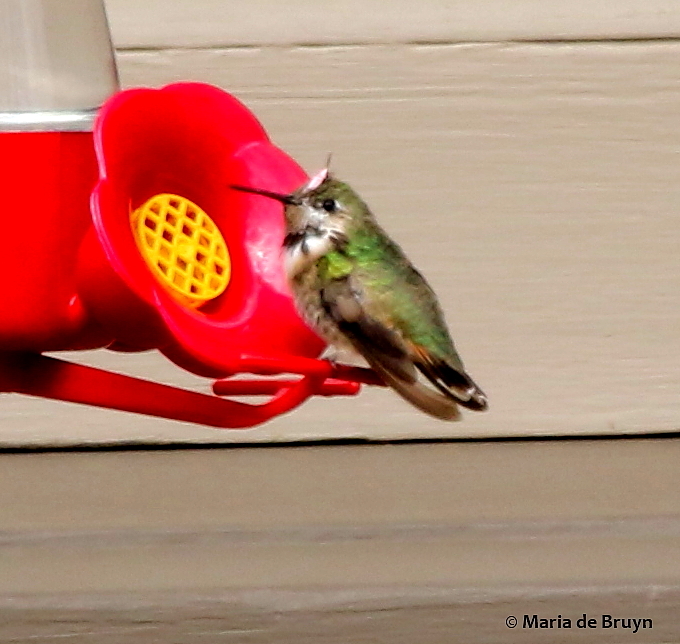 At the Malinski’s home, the calliope is keeping company with another winter migrant, a female rufous hummingbird (below, Selasphorus rufus). 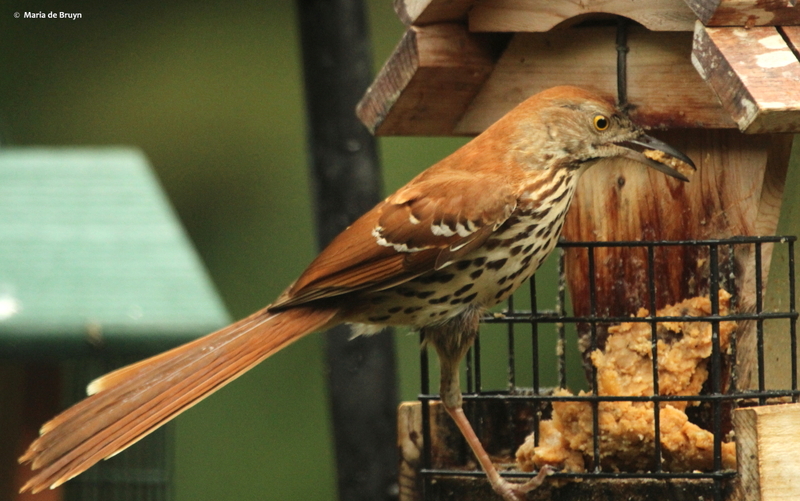 Mrs. Malinski has seen the rufous chasing the calliope away from the feeders, living up to that species’ reputation for being feisty. 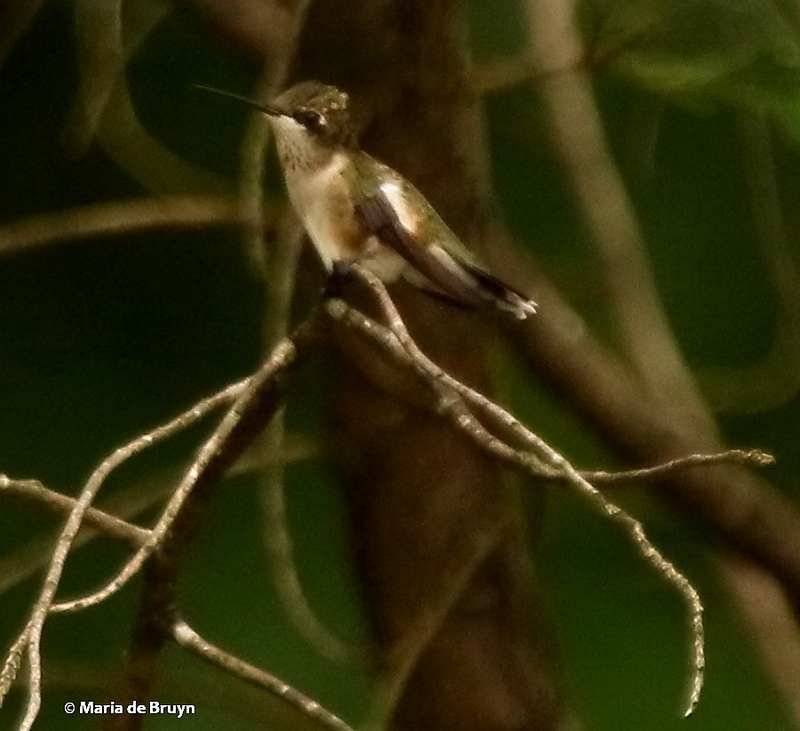 However, the calliope hummers are brave, too, even chasing red-tailed hawks (Buteo jamaicensis) away from their territories during breeding season! 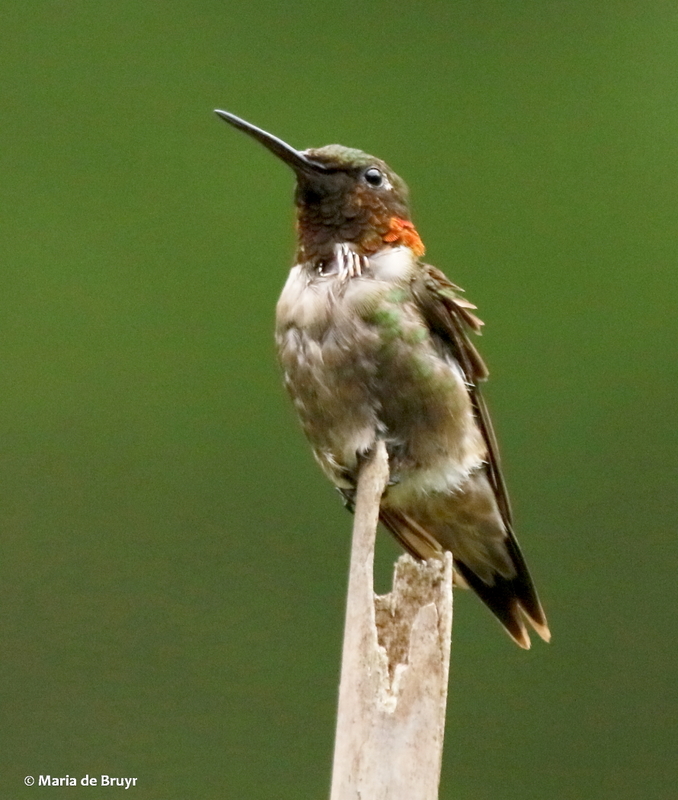 Joseph is currently molting and can be identified for the time being with a little topknot atop his head. 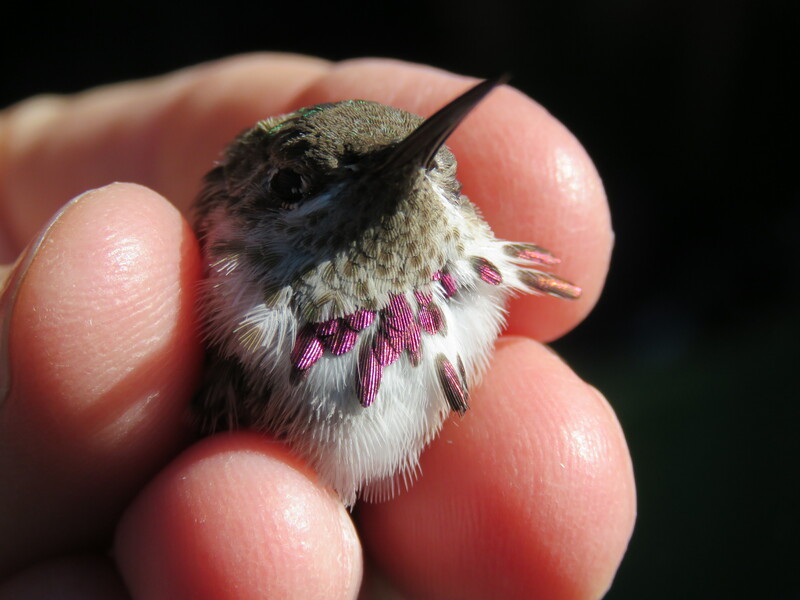 Susan Campbell, North Carolina’s well-known hummingbird bander, gave him his bracelet at the Malinski home, which should make it possible to identify him if he returns next year. 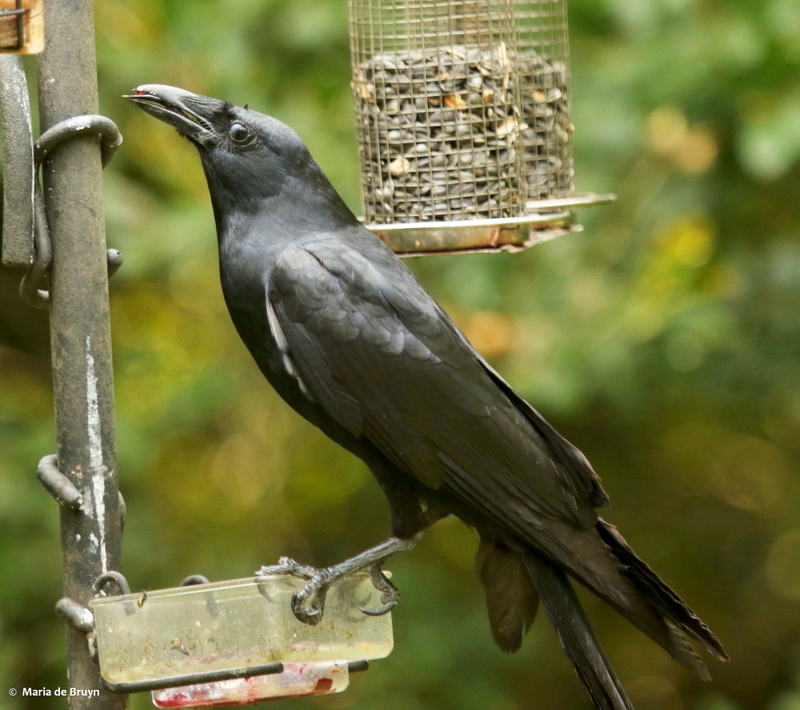 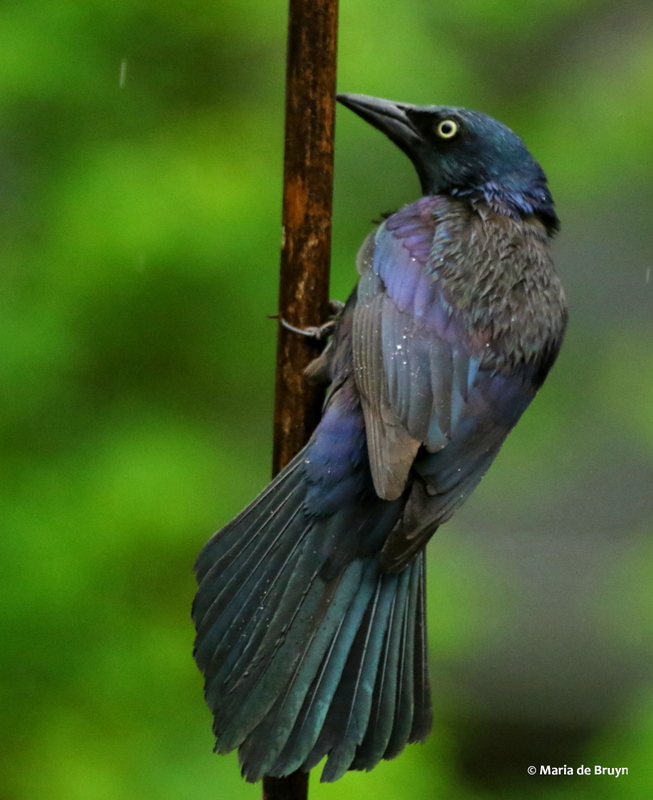 In this photo kindly provided by Susan, you can clearly see that he is developing the bright purple feathers that will grace his throat and give him a beautiful appearance in full maturity. 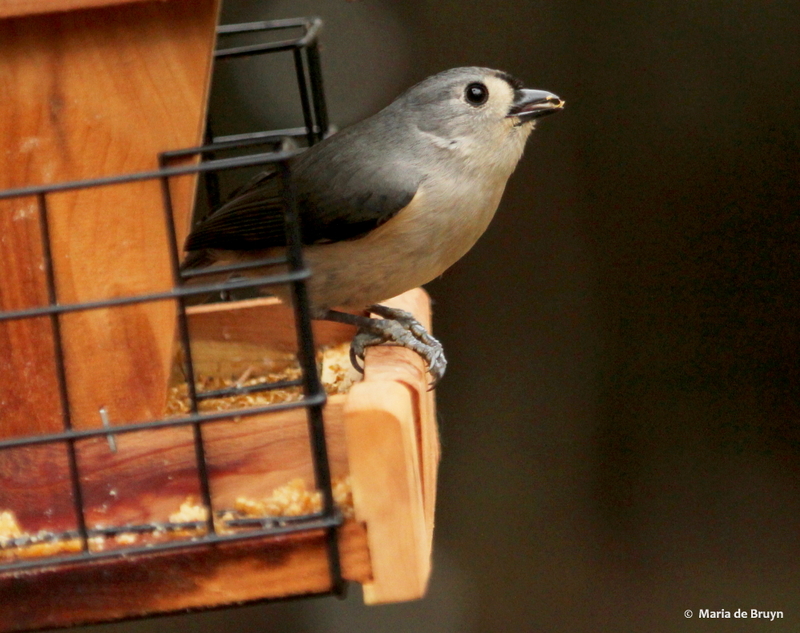 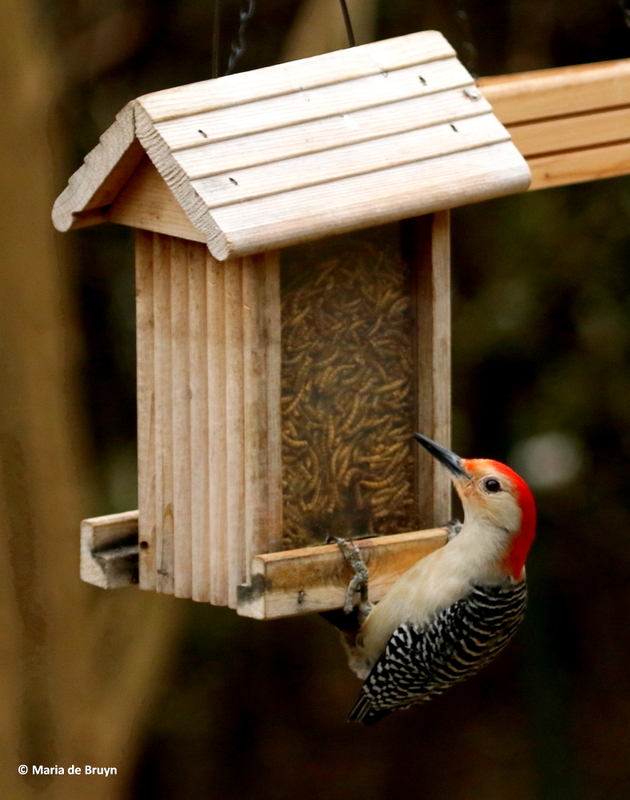 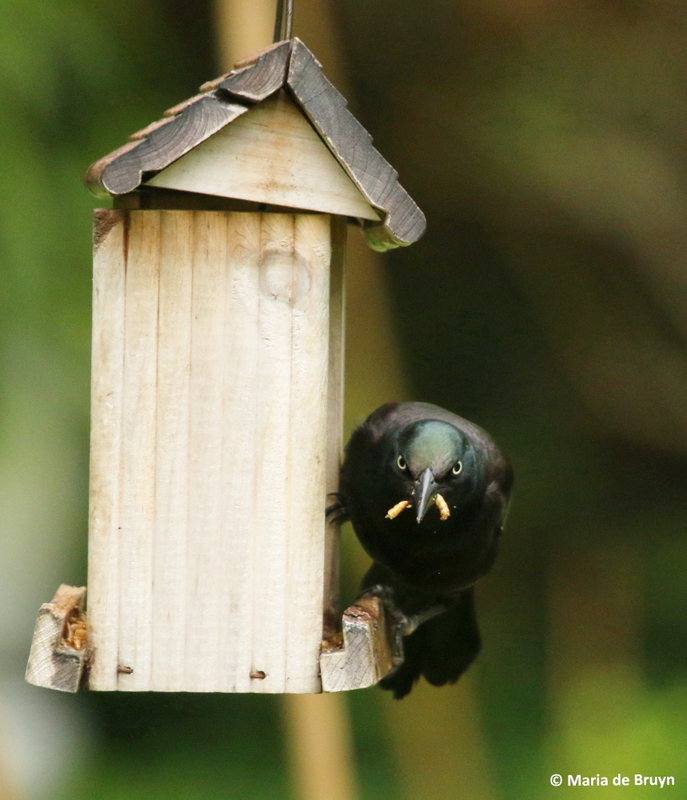 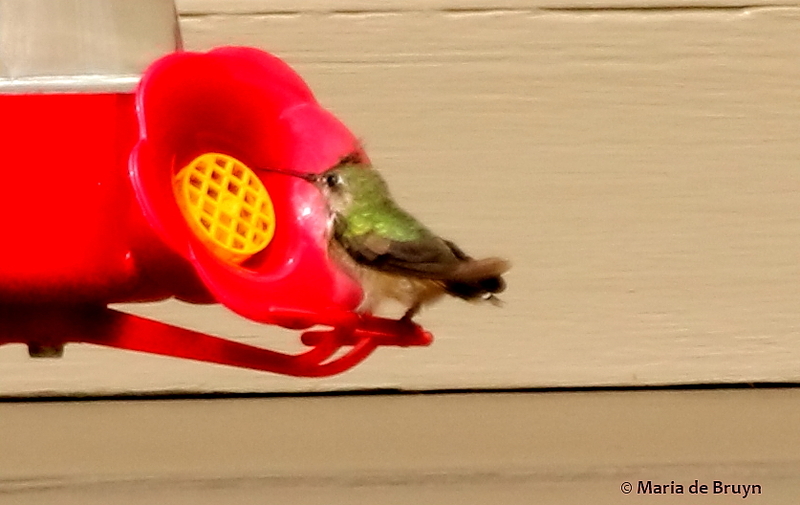 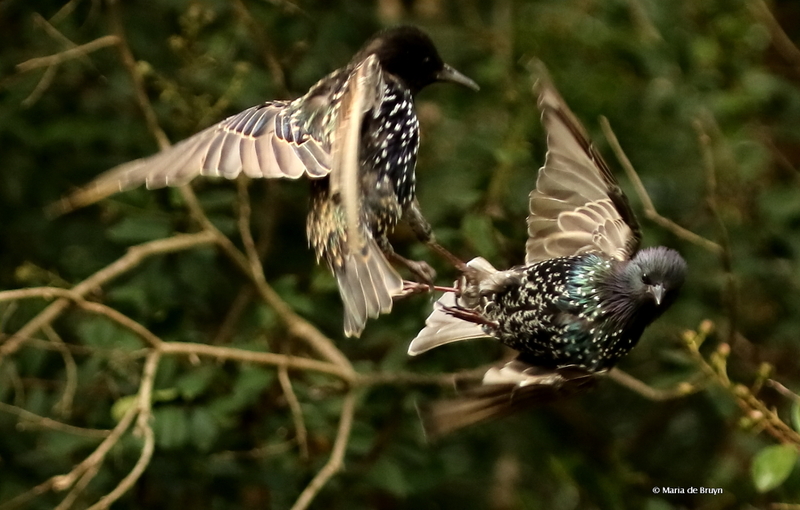 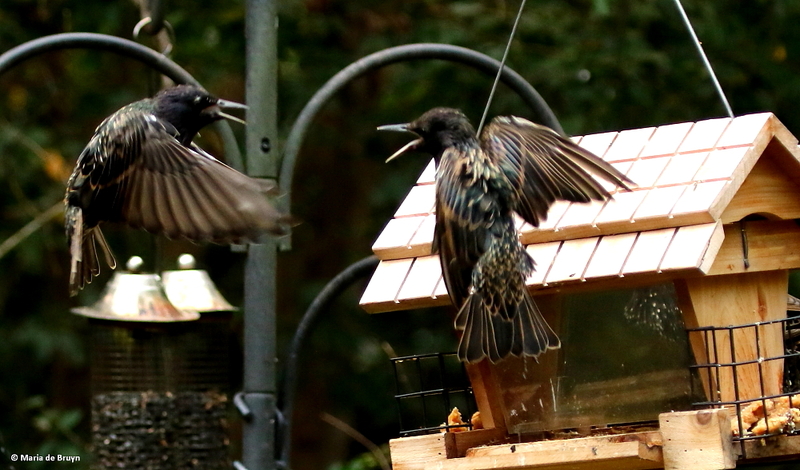 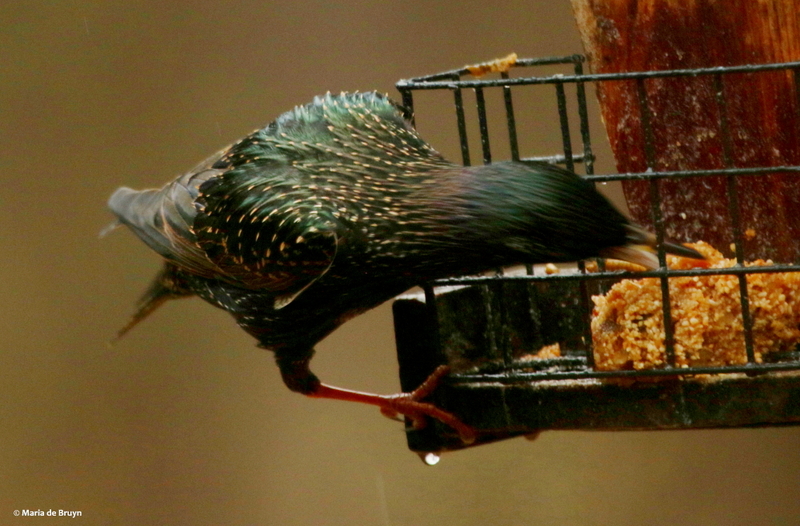 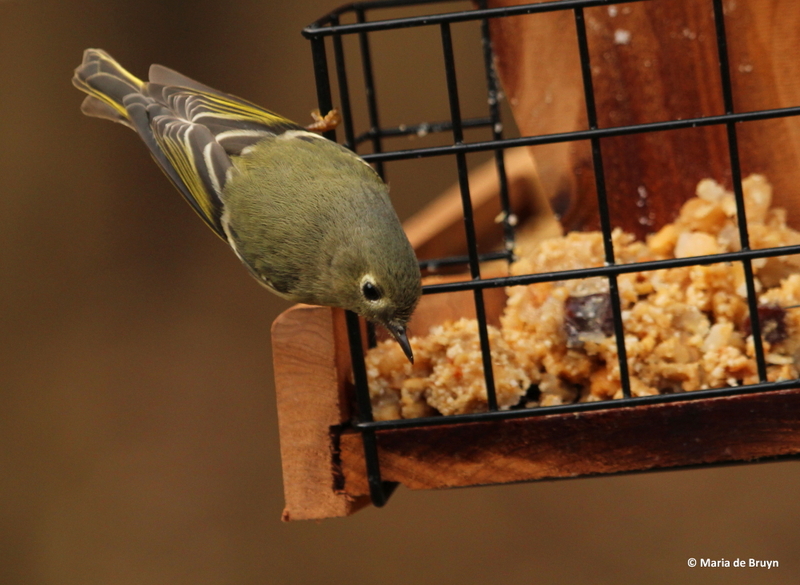 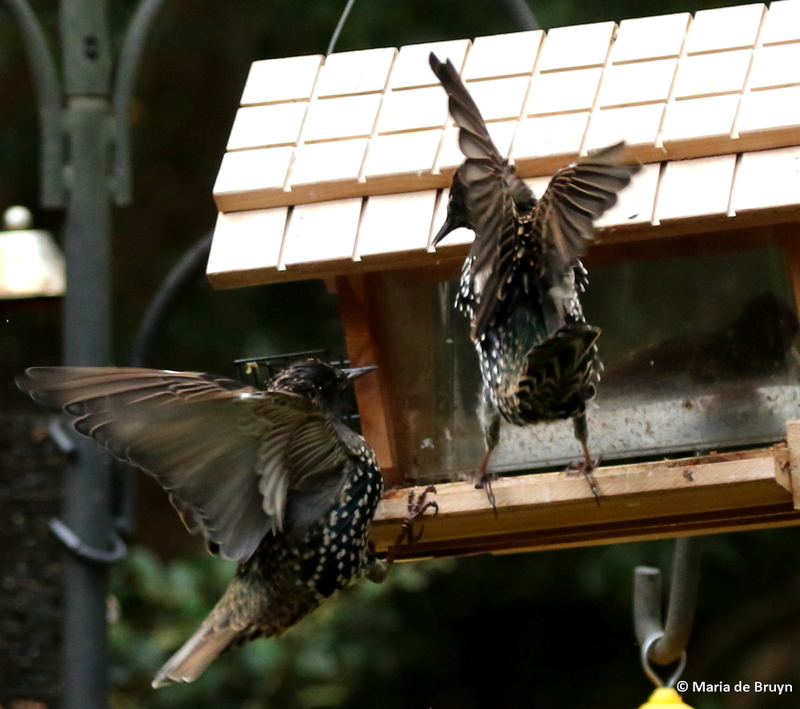 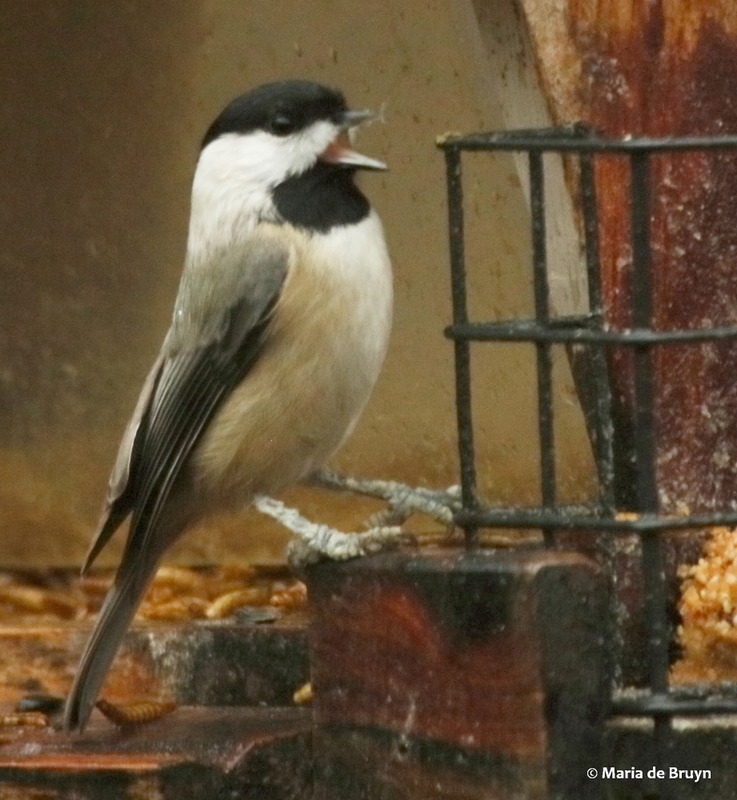 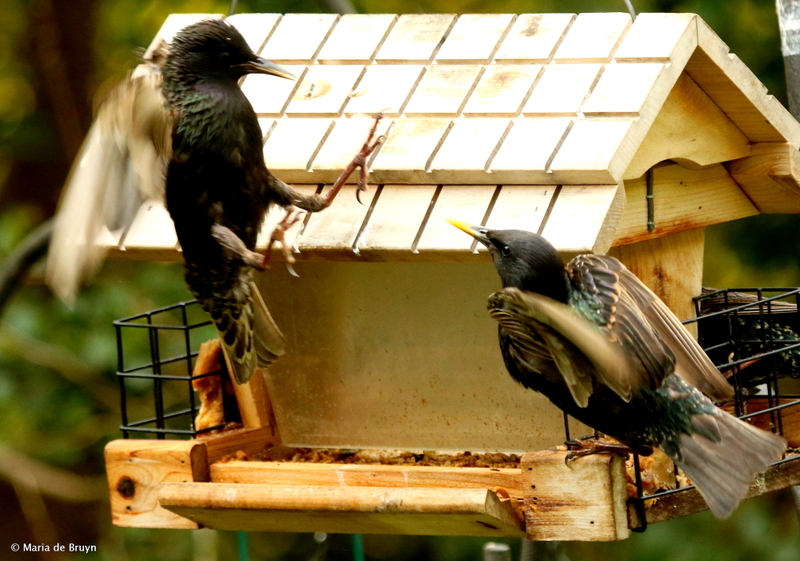 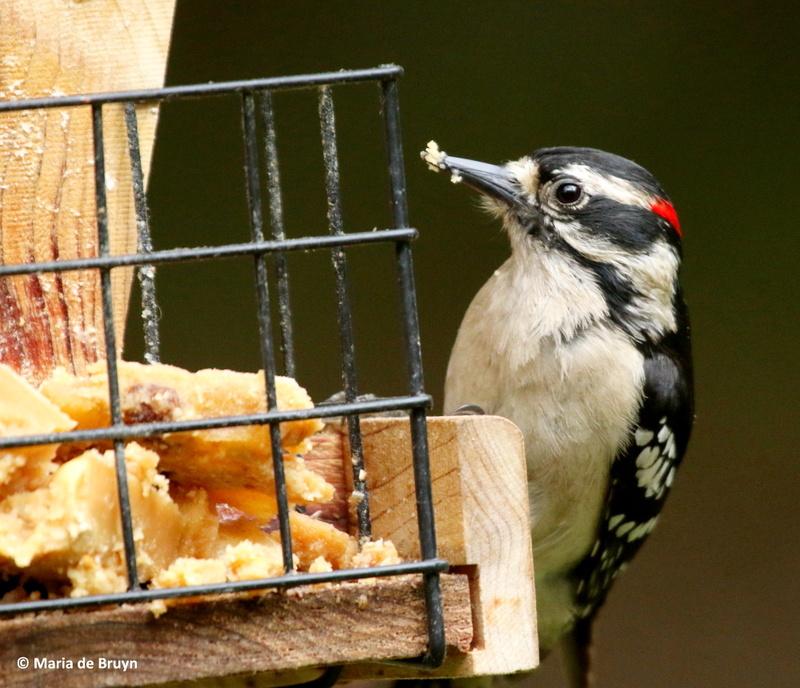 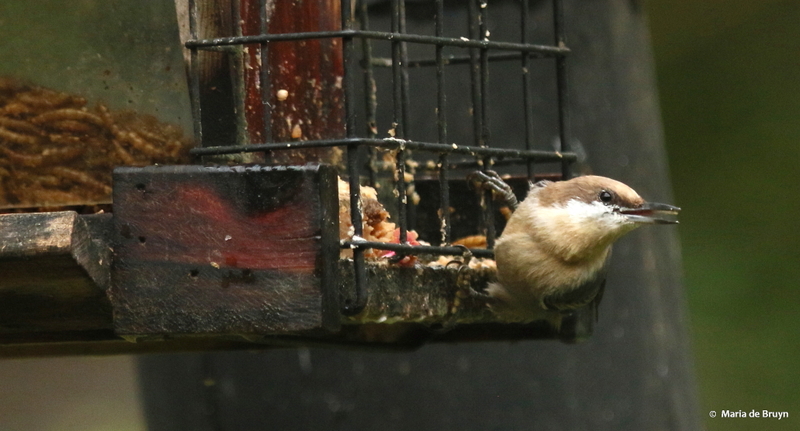 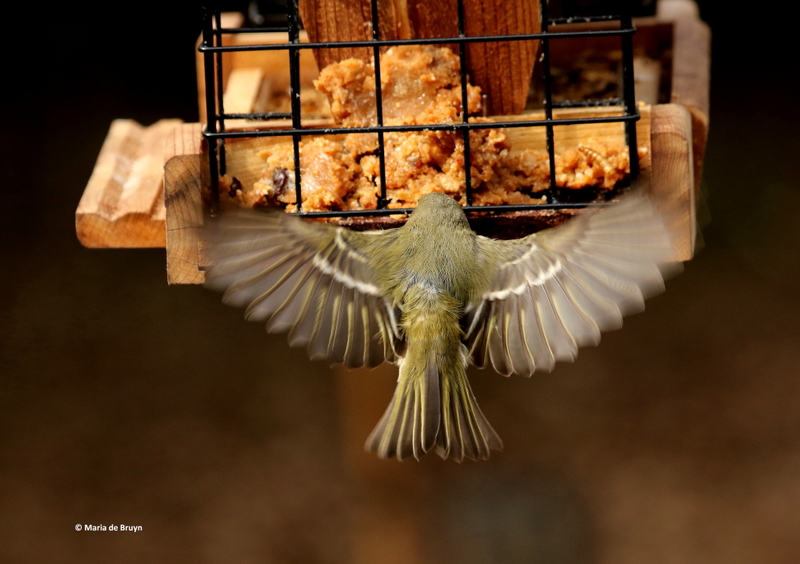 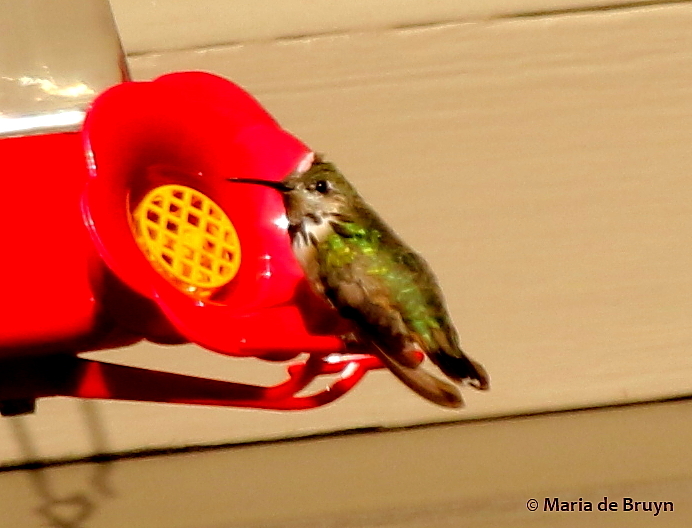 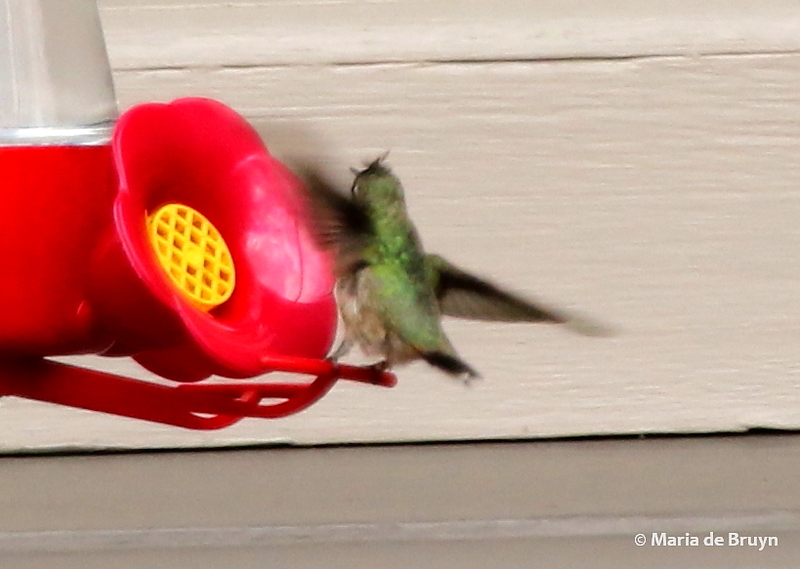 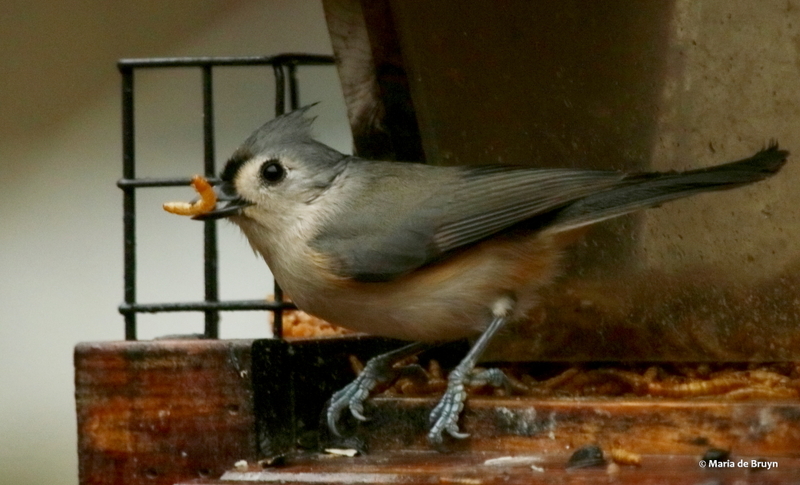 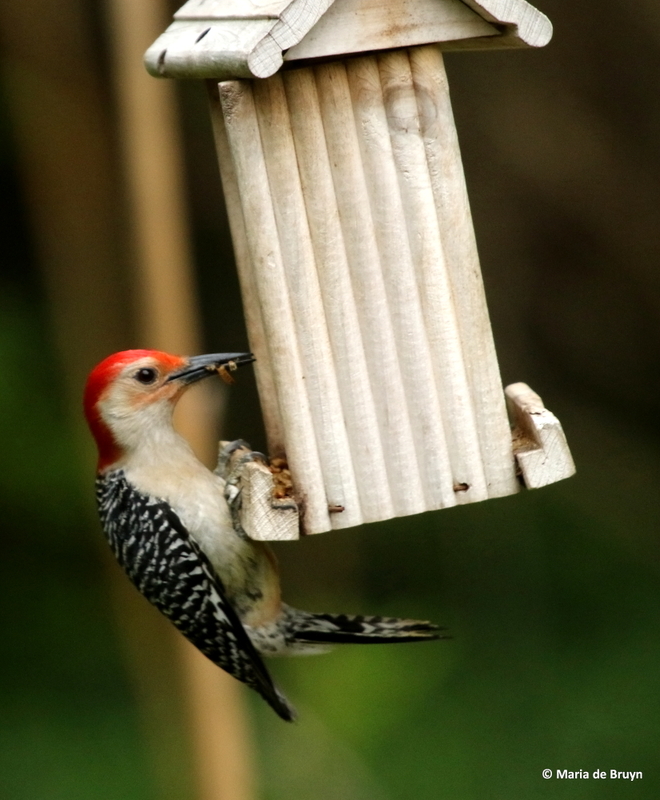 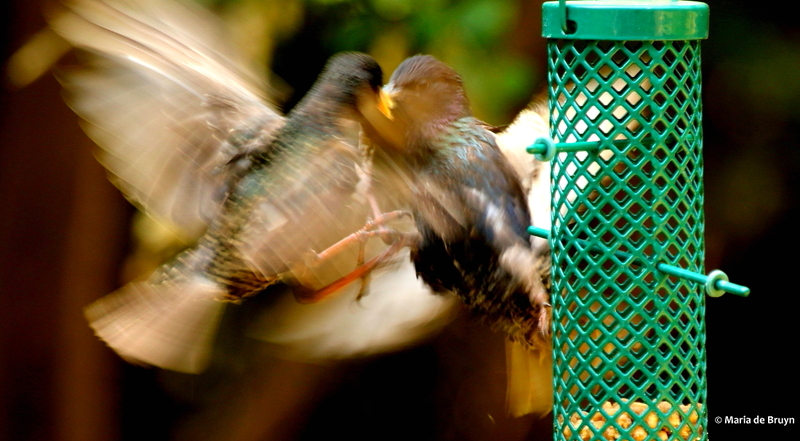 They are just a little visible when he zips in to land at the feeder. 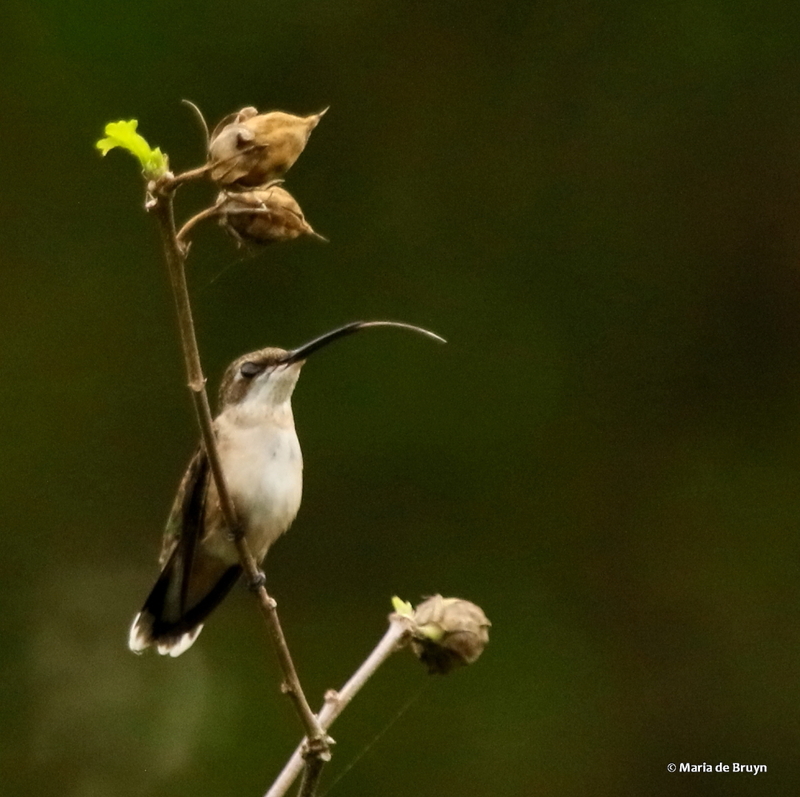 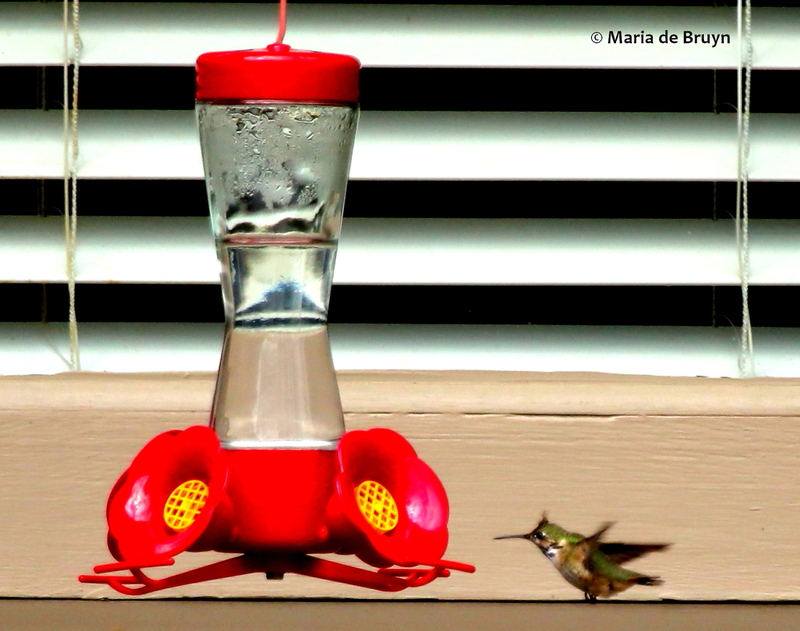 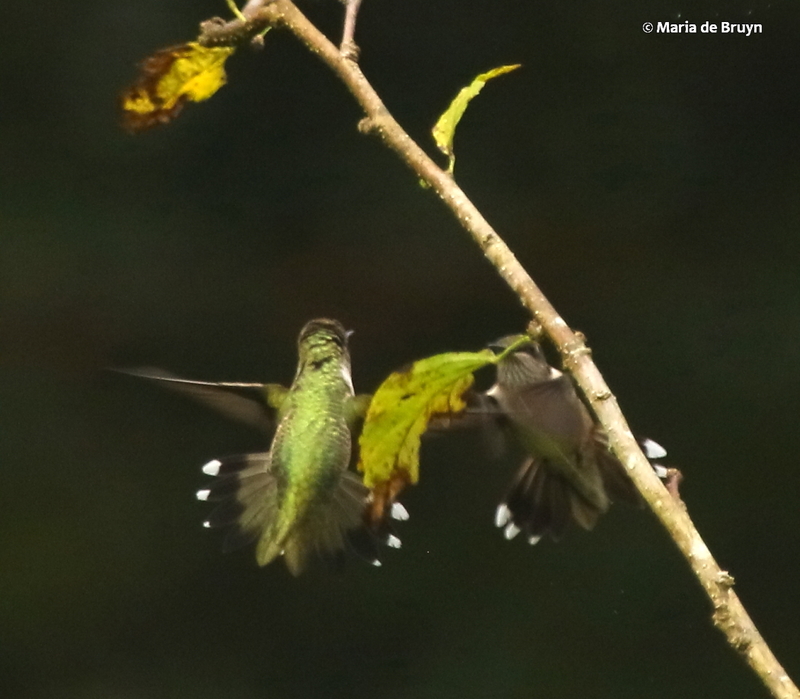 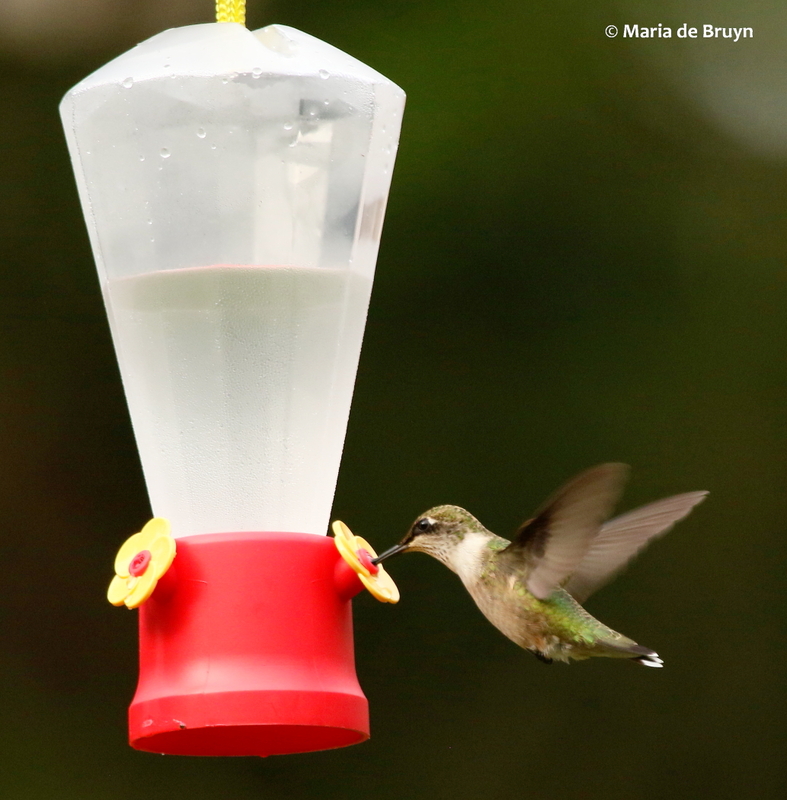 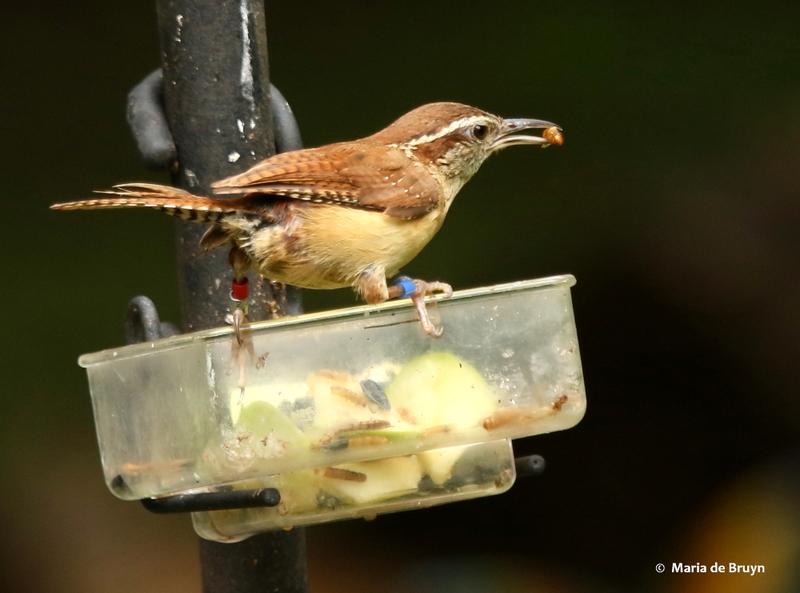 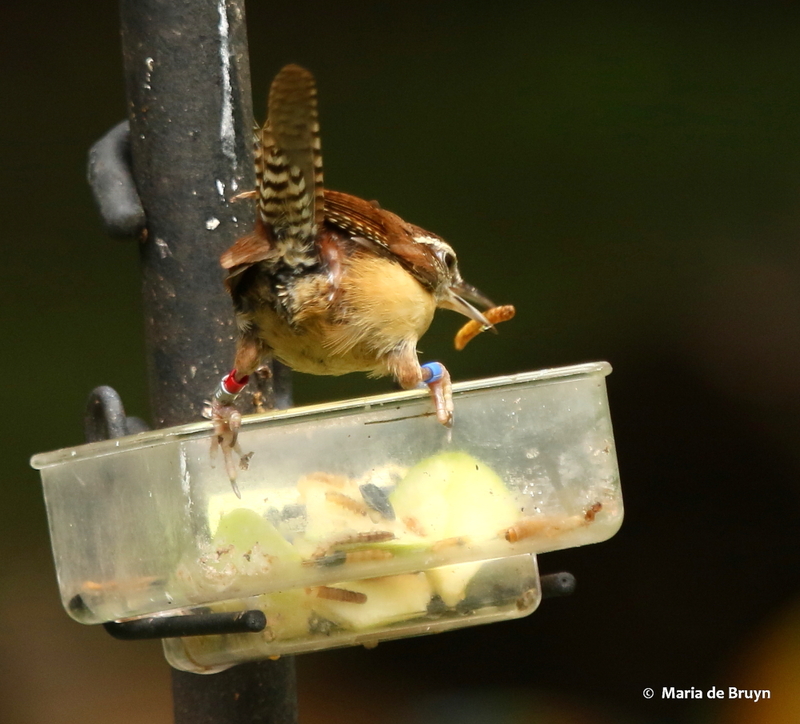 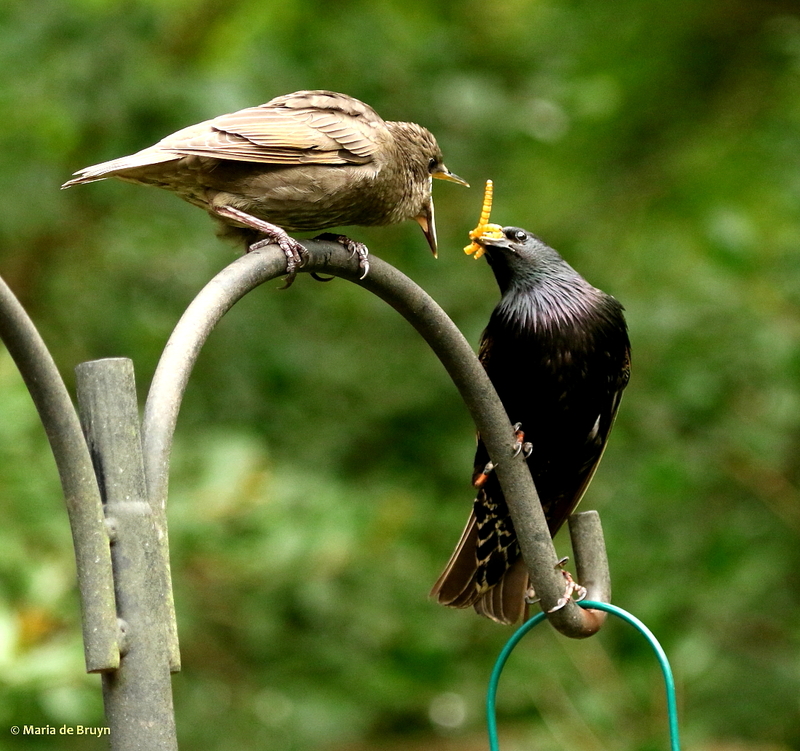 Both Joseph and the female rufous enjoy the nectar provided by the Malinski’s. 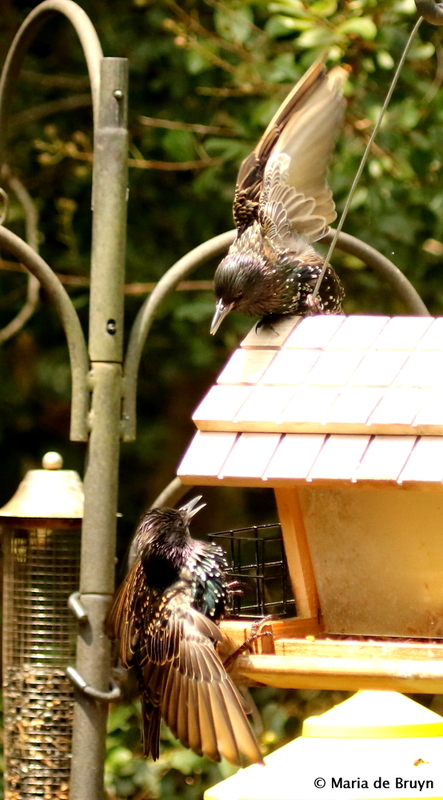 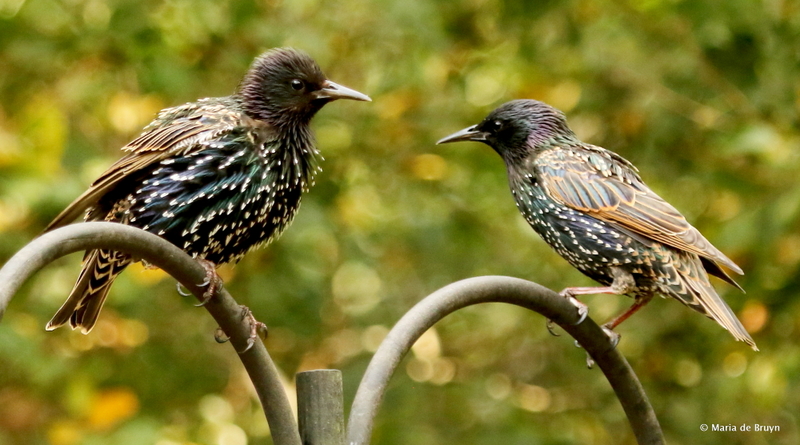 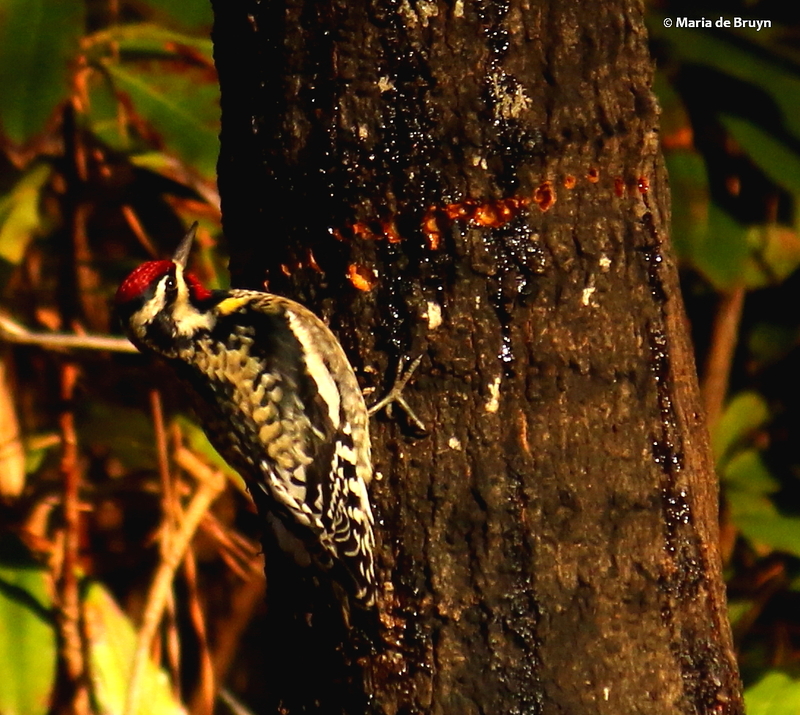 These birds will also eat insects and calliopes are known to drink from yellow-bellied sapsucker (Sphyrapicus varius) sapwells like those shown here. 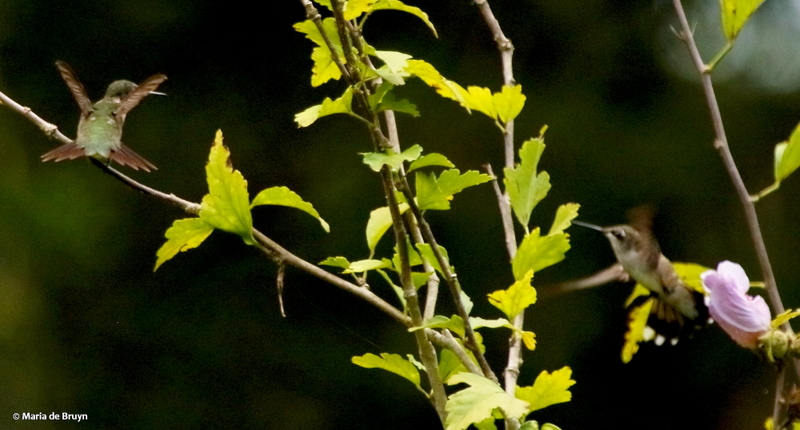 Many people have traveled to the couple’s home to observe Joseph. 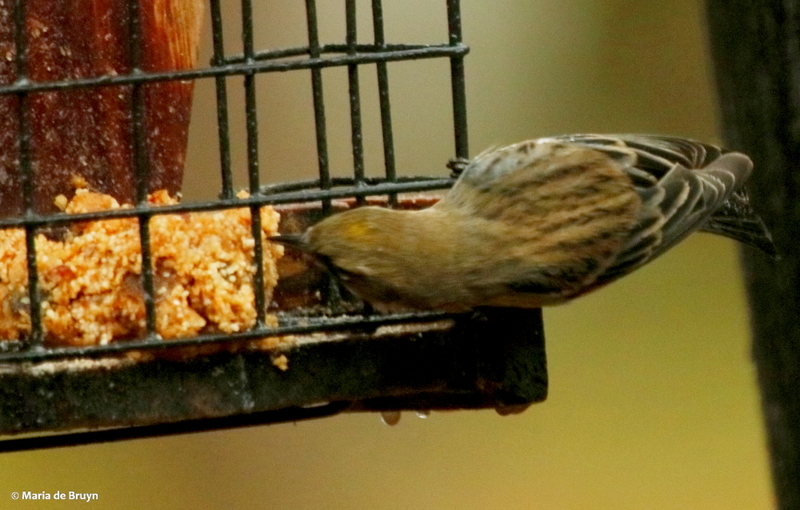 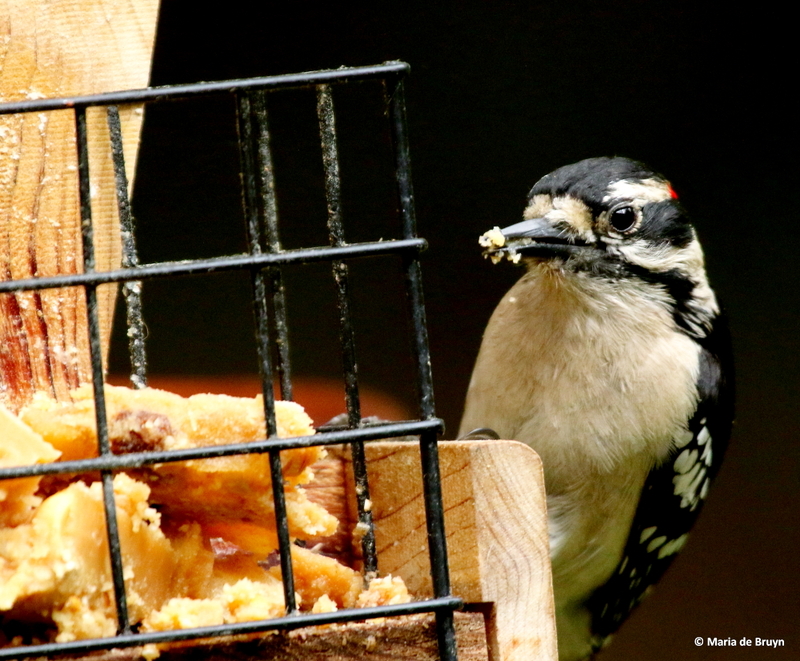 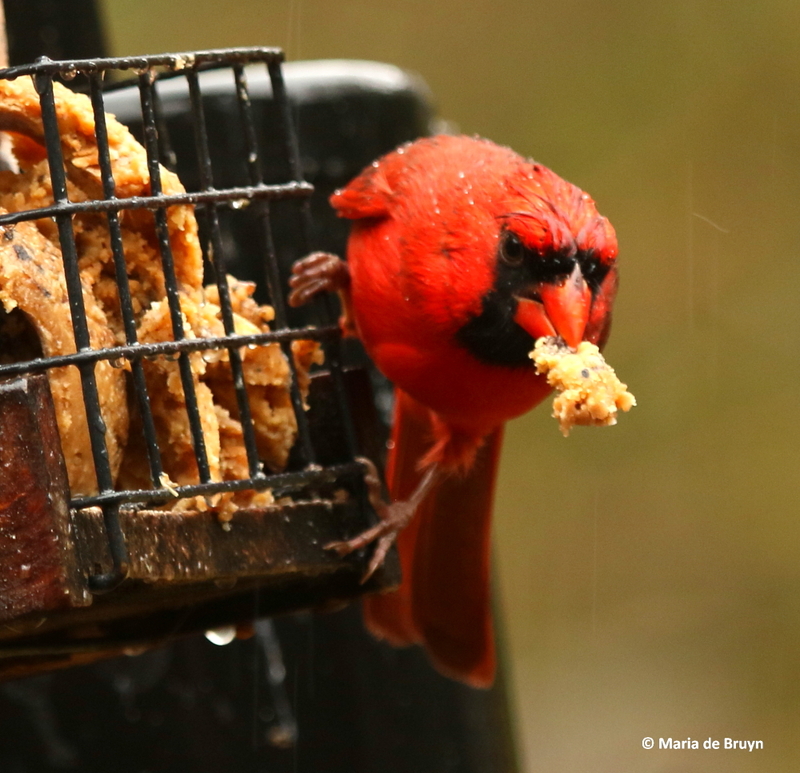 During my two visits, I encountered 10 other birders and I know of more who paid a visit. 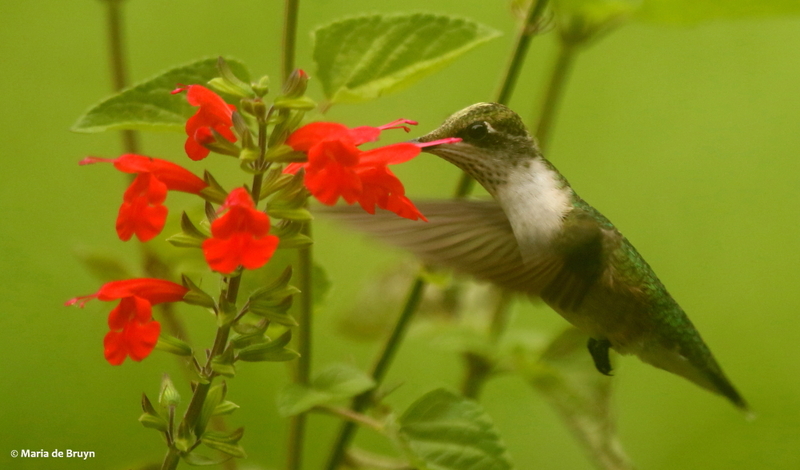 The Malinski’s are most gracious, allowing us to stay in their front yard for hours. 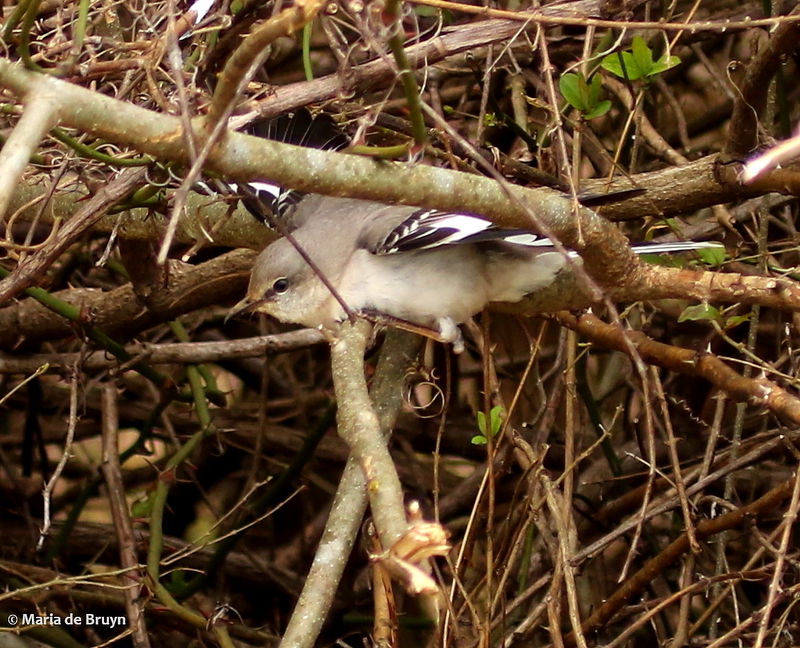 After I left them with Joseph buzzing back and forth between the front and back yards, I stopped at a rural road known as a spot for white-crowned sparrows. 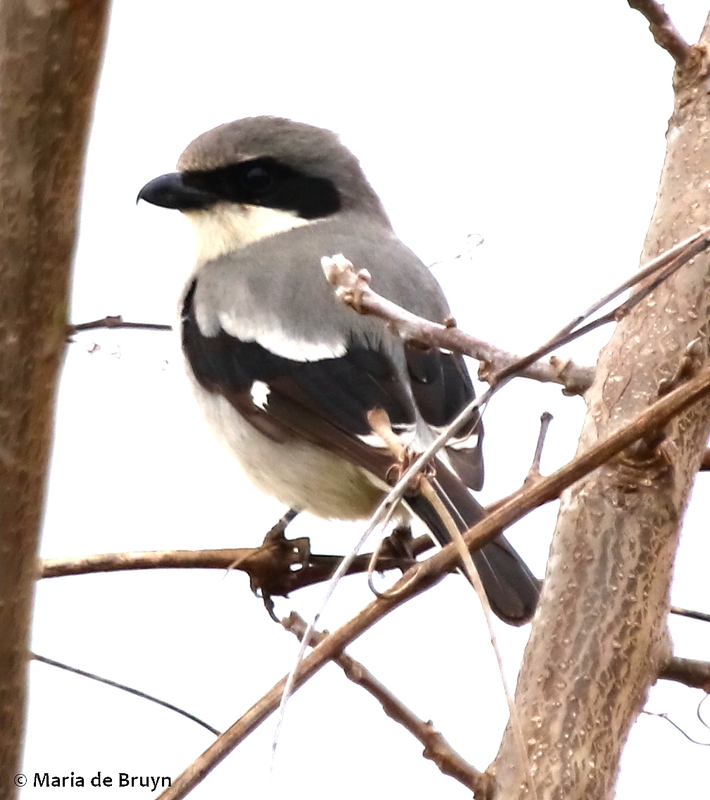 I didn’t see them but did get to see a loggerhead shrike (Lanius ludovicianus). 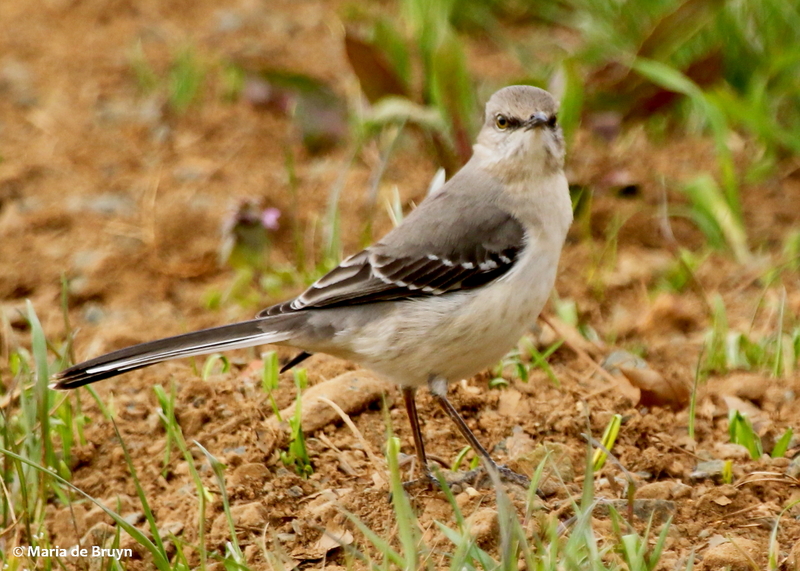 The Northern mockingbirds (Mimus polyglottos) were courting and chasing each other, making a fair bit of noise and flashing their lovely feathers. 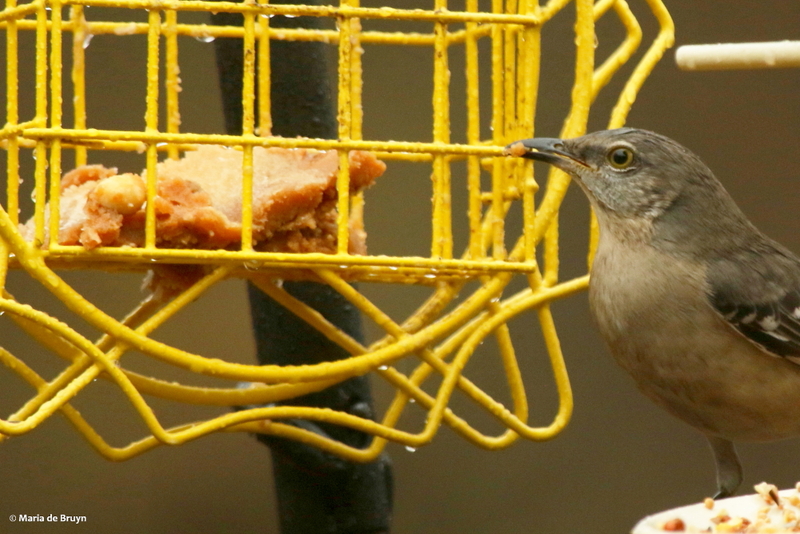 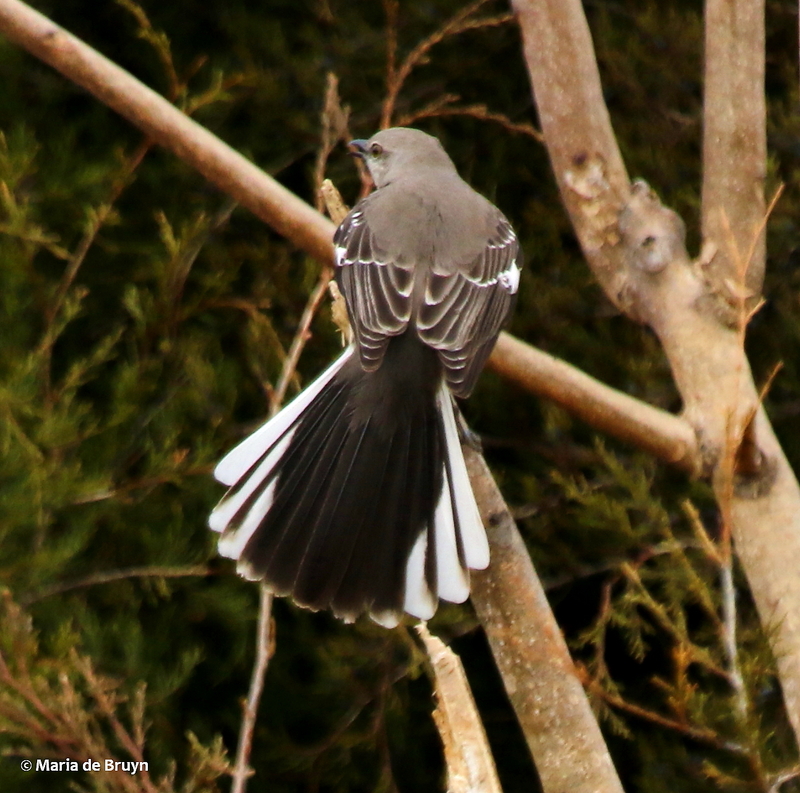 Even though mockingbirds live around my yard, I always enjoy seeing them again. 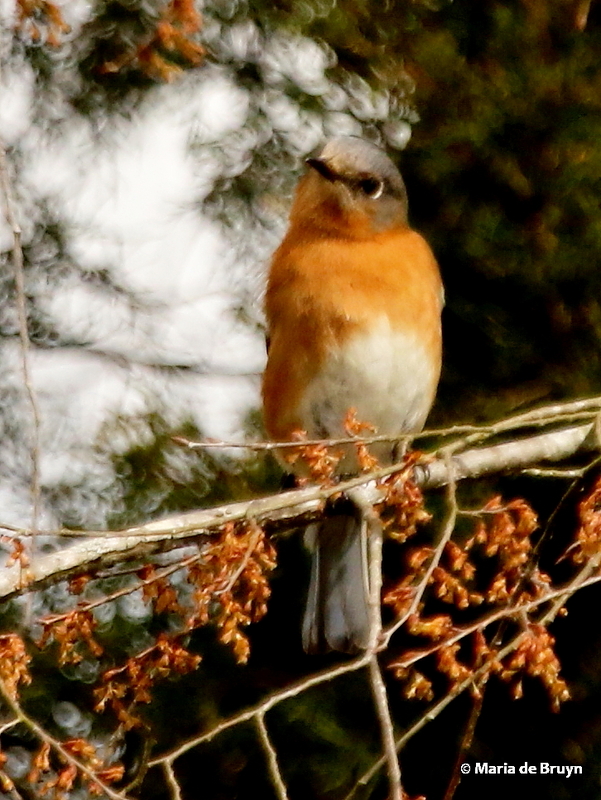 I likely never will become a birder who goes off to exotic lands just to chase down one species I haven’t seen before. 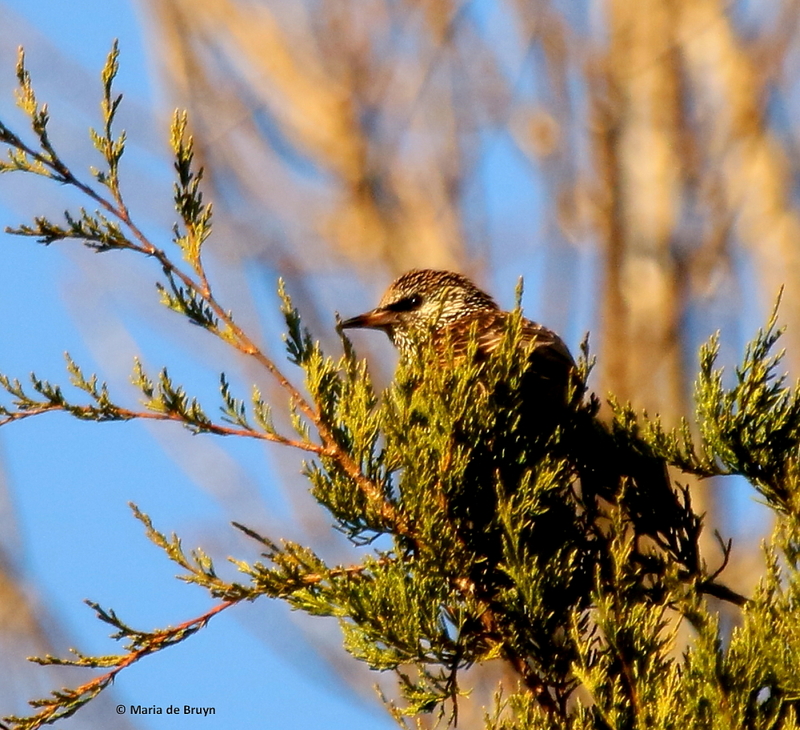 But I certainly am paying even more attention to the birds around me wherever I am and making some shorter forays as time permits (just yesterday, I joined friends Beth, Carol and Nan to go see a Wilson’s snipe (Gallinago delicata) at a farm in the next county – another lifer!). 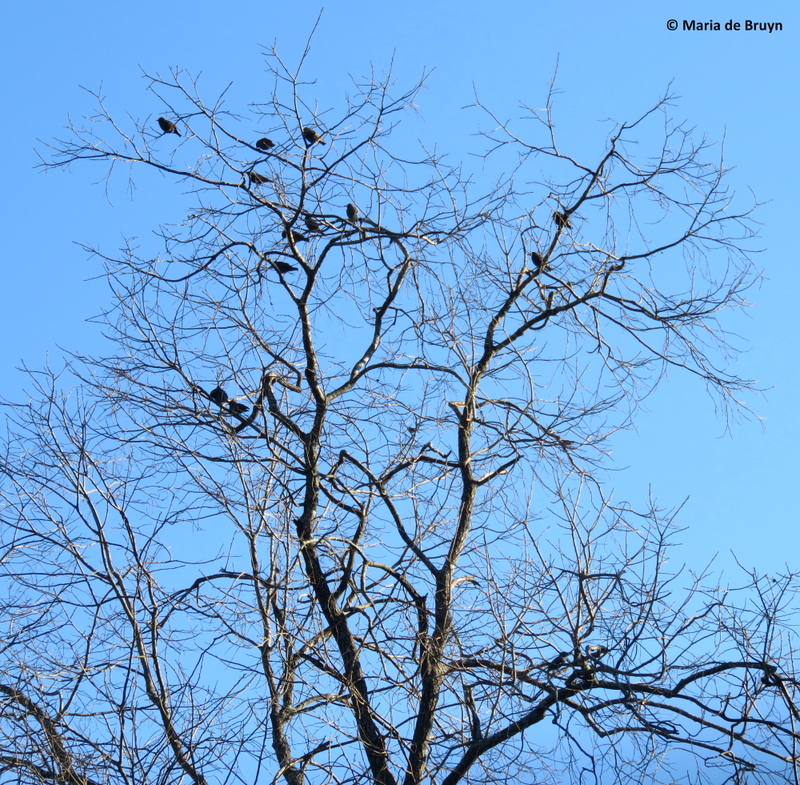 But it’s not only birds that will get me to travel – bears are on my list of animals that I am still hoping to see and photograph in the wild. 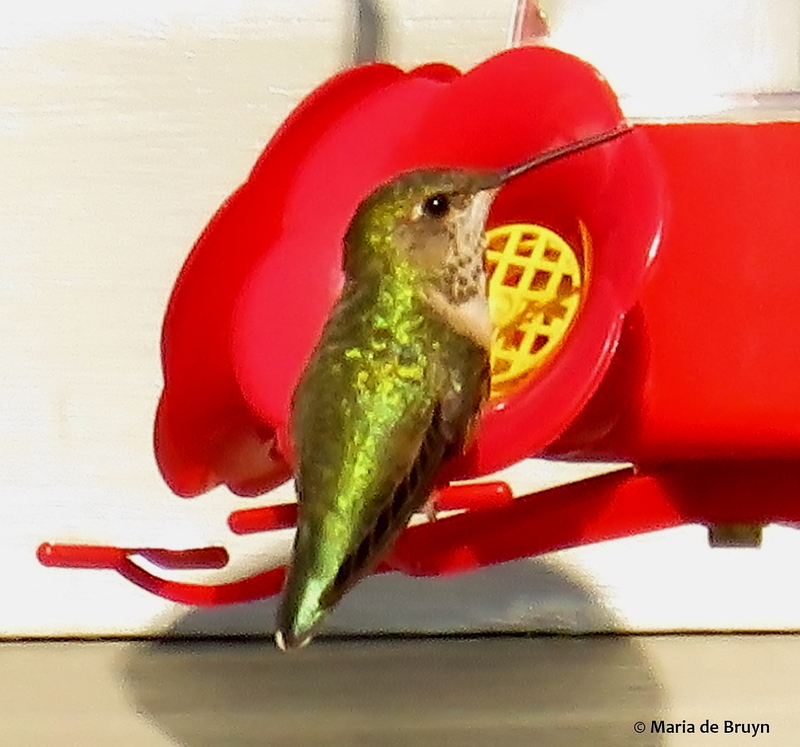 When I get to that point, you’ll read about them here, too!